What is the purpose for the pole in this picture? Notice that others exist across the street, and indeed, stretch on for blocks in this neighborhood. Yet in your neighborhood, none may exist. What else do you notice in the picture? What kind of houses do people live in, and what might the inhabitants be like? What does the vegetation imply about this area’s ecoregion? When were the houses constructed, and how has the area changed over time? The term “neighborhood” implies being near residents who are considered “neighbors.” How large of an area do you consider to be your neighborhood? Does the area that we define as our neighborhoods change as we grow older? Do you believe that a neighborhood’s size depends on our primary mode of transportation? What influence does rural or urban have on neighborhood size? What natural or human-made features influence what you consider to be your neighborhood boundaries? How could you use GIS to examine your neighborhood? Begin by examining topographic maps and satellite imagery using ArcGIS Online (http://www.arcgis.com). Add demographic data to your map and examine variables such as age, income, and ethnicity, as shown below. Examine lifestyle measures online (http://www.esri.com/data/esri_data/tapestry.html). Compare your neighborhood to others nearby or far away. GIS offers a rich toolkit for neighborhood analysis, and your investigation could continue through the examination of spatial statistics in ArcGIS Desktop. That pole? 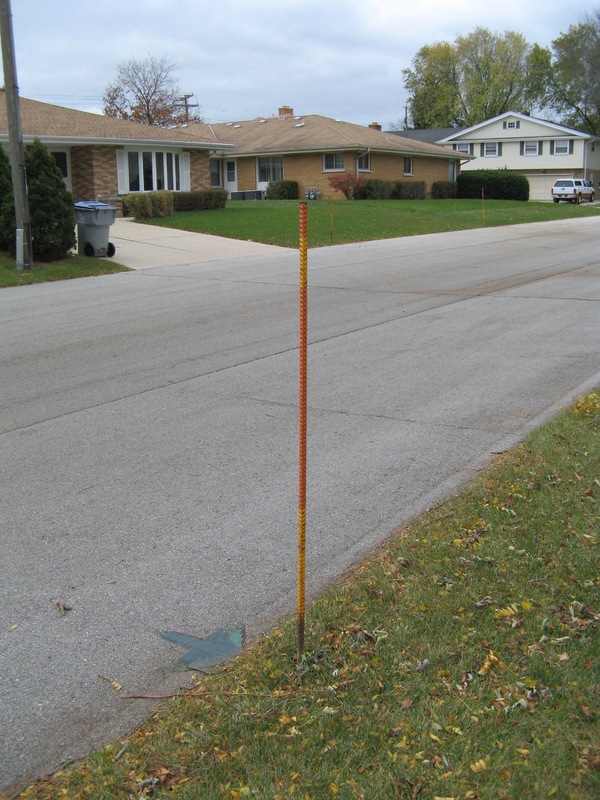 It is a plow stake, placed there every autumn so that in this area, which lacks sidewalks or curbs, snowplow drivers will know where the edge of the pavement is. Knowing this, and considering your earlier observations, where do you think this photograph was taken? I will post a comment to this blog entry after I have given you time to guess. Consider asking your students what makes their own neighborhoods unique, and use GIS to investigate the fascinating stories that their replies will lead to. Observing how the latitude remained relatively constant while the longitude decreased for the first 7 points, how the latitude increased but the longitude remained relatively constant from points 7 through 10, and how the latitude remained constant and the longitude increased for points 10 through 14. From these points, can students visualize that I must have first walked due east, then due north, and then due west? If not, help them visualize this by starting with paper, pencil, and the Cartesian Coordinate System, and then entering and mapping selected points using the Esri EdCommunity latitude-longitude finder, ArcGIS Explorer Online, or ArcGIS Explorer Desktop. In addition, can they visualize based on the coordinates that the area traversed is not that large? Once the students can start to visualize their world as x and y coordinates, then map the data, as I did in ArcGIS Explorer. Did the coordinates map where they had predicted they would be? I am continually amazed at how accurate even recreational-grade GPS positions can be. Using the measure tool in ArcGIS Explorer, I discovered that the trees I was mapping were between 1 and 5 meters off from their location as indicated by the Bing satellite image. Try this technique with your students and let the GIS education community know what you discover! Like using any technology, using GIS in education involves change. Do you sometimes feel that you are not keeping up well with hardware and software changes that inevitably are a part of our world? Two things have helped me in my GIS career to cope with change. First, one of the things that makes the GIS community special is the open way that everyone shares their knowledge. Even before we had online knowledge bases and Twitter posts, the community was active via telephone, in conferences, and through scholarship, sharing what they knew with others. Realizing that each of us cannot be an expert at everything, but knowing that the community is there to help takes much of the pressure off. Second, with each new version of ArcGIS, the tools are becoming more powerful, and easier to understand, to find, and to use. Yes, it does mean that all of us need to be flexible, but that keeps us moving forward, becoming lifelong learners. Think of the alternative to moving forward in computer software and hardware. Moving backwards would be worse than the movie “Groundhog Day,” where every day was February 2. Each year, the software would become less powerful and so would my computer. I would lose the cloud. To find data, we would soon be back when all of the web pages were yellow text on a black background. We would then lose the web entirely and rely on gopher, ftp, Lynx, and Archie. Then we would be dependent on telephone calls, spanning floppies with zipping utilities, and 9-track magnetic tapes. At home I would eventually be back on my first PC, an IBM PS/2, using minicomputers and then mainframes at work, restricted to low-resolution imagery and then only vectors. Eventually, I would be sharpening my scribing needle again and unclogging my Rapidograph pen – not a task I would relish. If time ran in reverse, I suppose it would have a few advantages. I would find those sunglasses I lost. But I would be back to the horrible sink I replaced in the bathroom. But much more importantly, GIS would not be as effective in education and society as it is today. I recently wrote about using GIS technologies to analyze one recent event—the toxic liquid spill in Hungary. I used ArcGIS Online (http://www.arcgis.com) to find a map that I could use to analyze the spatial and temporal aspects of the spill, in this case, with ArcGIS Explorer (http://www.esri.com/arcgisexplorer). Have you considered using something like this as part of a GeoNews segment, where you start all or some of your classes by analyzing one current event from a spatial perspective? Have you considered using GIS as a tool to enable you to do this? Lest you think that such an activity requires a great deal of set-up time, let me assure you that today’s combination of Web GIS and multimedia make this very easy to do. My example from Hungary is only one of hundreds of events that are routinely tied to Web GIS resources annually. And if you cannot find a Web GIS already made, it takes only minutes to create one of your own. Furthermore, the presentation capabilities that are embedded in ArcGIS Explorer and ArcGIS Explorer Online allow you to create interactive slides that help you tell the story. My colleagues and I modelled the GeoNews concept at this year’s T3G institute for educators in Redlands. Each day of the institute, two of us taught a 15-minute segment about events that were unfolding around the world at the time. You can watch examples of this in action via the movie on the T3G site. After you have modelled GeoNews, assign your students the task of creating and teaching their own short segments. Emphasize critical thinking about these issues and the examination of these issues using the spatial perspective. Students may begin to realize that everything has a spatial component and that, yes, geography matters now more than ever in our interconnected world. Some educators I know already make heavy use of current events in their everyday teaching. How can you make use of the GeoNews concept to put a spatial context to these current events? A reservoir at an alumina factory in Hungary burst in early October 2010, causing a toxic torrent of water to flow through three villages and creeks. People and fish died; livelihoods were destroyed. Yet from a spatial perspective, we all know that the problem did not end with those three villages and creeks. The water had to flow somewhere. But where? A quick search on ArcGIS Online (http://www.arcgis.com) uncovered a pertinent layer. I opened this layer and found a series of news articles, photographs, and videos linked to the locations where they were recorded on the ground. Analyzing the spill in a GIS environment allowed me to make sense of the scale, landforms, population, and watersheds affected by the disaster. Suddenly, I had a spatial context and perspective that reading disconnected news stories did not provide. ArcGIS Explorer allows you to navigate the landscape in a 3-D environment, changing the base map in order to examine nearby towns, lakes, and ultimately, how the spill reached the Danube, one of the most important rivers in Europe. Like paper maps have allowed us to do for centuries, a GIS helped me to understand, and to tell a story to others. And like most geographic phenomena, I can examine this in other disciplines—for example, in biology to understand the importance of pH, in economics to analyze the importance of alumina, and in mathematics to calculate the distance and time of sediment transport. As explained in GIM International, hyperspectral and Lidar imagery was collected and used in a GIS and remote sensing environment to model scenarios and to detect future damage to dams. This article points to the critical role that geotechnologies have in every disaster that occurs nowadays to help policymakers and residents in the decisions they have to make. Another thing to turn into a teachable moment is an observation that struck me in searching for news about the disaster. Almost every news story was published in the first week of the disaster, with almost nothing since then. Recognizing that news is a business and that to sell it, it has to be current, I was sad to consider that this event held the world’s attention for only a brief time, yet the local residents are still dealing with the effects on a daily basis and may continue to do so for years. What are the temporal and geographic aspects to human-environment interactions? How can you make use of ArcGIS Online to analyze current events? Running through the session was the theme of the digital earth—to make accessible a wealth of geospatial data and tools that enables people to make everyday decisions more efficiently and wisely based on the spatial perspective. The now-familiar concept of citizens as sensors was mentioned frequently. That the EPA discussed having citizens monitor air and water quality is another indication that citizen science will be increasingly relied upon as part of the geo-monitoring system for the planet. That has enormous implications for standards, quality, and the metadata and databases that will need to be in place for it to be effectively used. Dr. Peggy Agouris’ report about the recent NSF-sponsored workshop on geospatial and geotemporal informatics was encouraging. The workshop identified new challenges in information extraction and modeling, stated that data collection was still important and needed to be supported in industry, nonprofit organizations, and government agencies, and identified support for cross-discipline discovery using spatiotemporal information. Tim Nyerges (University of Washington and University Consortium of GIS) reminded us of Keith Clarke’s UCGIS grand challenges from 2006: What is the cost to the nation of geospatial information that is inaccurate, over-accurate, or out-of-date? What role can geospatial technologies play in eliminating geographic illiteracy? In what ways have we yet to exploit the superiority of digital maps over paper maps? Can we complete a digital earth by 2009? (!) By how much can effective use of geospatial information improve human safety and welfare while reducing the associated costs? How can we best articulate GIScience as a core of interdisciplinary science, supporting information integration across multiple disciplines in large research projects? Tim also spoke about developing an assembly of geospatial technical and social components and activities that implement a regional network for disaster preparedness and response for the nation. This seems especially urgent in light of the Gulf oil spill! Next week, I will put forward some “grand challenges” for GIS in education, and I welcome your thoughts. Many of us in the GIS education community recently participated in the annual ESRI International and Education User Conferences (http://www.esri.com/uc and http://www.esri.com/educ). Two things are clear to me after reflecting on the years I have been attending these events: First, geography is applied daily around the world to solve real problems. The work on display from 13,000 attendees—hundreds of papers presented, a gallery of 1,000 maps, 500 government, nonprofit, industry, and academic exhibitors, make it clear that the geographic perspective and spatial analysis are highly valued skill sets. Understanding how to operate GIS software is not enough—it is the application of the geographic framework within critical thinking and analysis that makes the difference. Second, the variety of disciplines represented—from human health to business, energy, hydrology, seismology, planning, and beyond—show that the geographic perspective is applied far beyond geography. Are the core themes of geography finally considered important by the workforce and the general population? Scale matters, planning for sustainability is critical, regions endure even in the face of globalization, humans have deep impacts on the environment and the environment continues to impact humans, movement, flow, and patterns have a critical geographic component, and humans and places exhibit wonderful diversity that need to be treasured. The size and viability of these conferences and of the GIS community indicate that the geographic perspective is becoming more valued given the local to global issues we face today. However, I believe a disconnect still exists between the great respect that the geographic perspective has within the GIS community and the respect that it has in society and with educational policymakers. Geography education is still not connected in most people’s minds to the type of geographic skills that we must have in our workforce. We need to refer policymakers to the new Geospatial Technology Competency Model , which goes beyond technical ability to content knowledge and critical thinking skills. The amount and quality of geography taught and learned is still not what it could be. That’s why I believe that the work of the geography education community is critical. We must continue to support initiatives such as the AAG’s Blueprint for Geography Education, the Geography Map in the Partnership for 21st Century Skills, and geography’s inclusion in the Common Core State Standards movement. We also need to work together on new initiatives to ensure that geography is funded, supported, and tested so that it can be strengthened. We must provide society with individuals who have the geographic perspective. I encourage all of us to work together on this important task. For five decades, the College Board’s Advanced Placement Program (AP) has provided students with the opportunity to take college-level coursework and earn college credit while still in high school. AP courses exist in 30 different subjects, each ending with a rigorous exam. 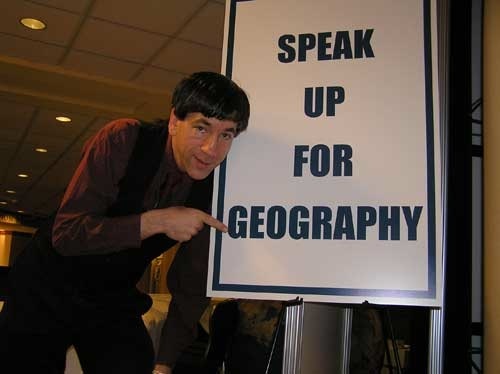 The tireless efforts of many geography educators culminated in the first AP Human Geography (APHG) course, offered in 2001 with 3,272 students taking the exam. In 2010, over 61,000 students took the APHG exam. During the summer of 2010, 39 APHG teacher institutes were held in 24 states. These are encouraging signs that the subject is gaining ground in the secondary school curriculum. AP Human Geography participation by year. Samantha Ross, National Geographic. The five major topics covered in APHG courses are based on the National Geography Standards developed in 1994. Upon the successful completion of the course, the student should be able to: (1) Use and think about maps and spatial data. (2) Understand and interpret the implications of associations among phenomena in places. (3) Recognize and interpret at different scales the relationships among patterns and processes. (4) Define regions and evaluate the regionalization process. (5) Characterize and analyze changing interconnections among places. I have personally observed teachers instructing APHG, and have always been impressed with the depth of the topics covered. It truly is the type of college-level course that I believe we need to be teaching more of in secondary education. I only wish we had an AP Physical Geography course as well! Would anyone like to spearhead that effort? Unfortunately, the mean score for the APHG exam this year was 2.56, the lowest mean score for any AP test (passing is 3). Part of the reason is that most students taking the course are in Grade 9, with perhaps only one semester or one year of geography behind them, several years earlier. The use of GIS can help raise these scores and more importantly, help students understand the spatial patterns that are such an integral part of the course. How? We will explore that in my next blog column. What do Earth Day and GIS have in common? Earth Day began in 1970, with one of its goals to help people take steps to ensure that sustainable practices are followed to protect the environment. I like to think of Earth Day as incentive for what we should be thinking about and doing the other 364 days of the year. GIS also began around the same time, during the 1960s, and like Earth Day, its disciplinary roots are older. ESRI began the year before the first Earth Day, in 1969, as an environmental and land use consulting firm. Despite the changes that have taken place since then in how Earth Day is celebrated, and also how GIS is used, they both have empowered people to understand Planet Earth and to do something positive as its inhabitants. How can GIS be used to benefit the environment? 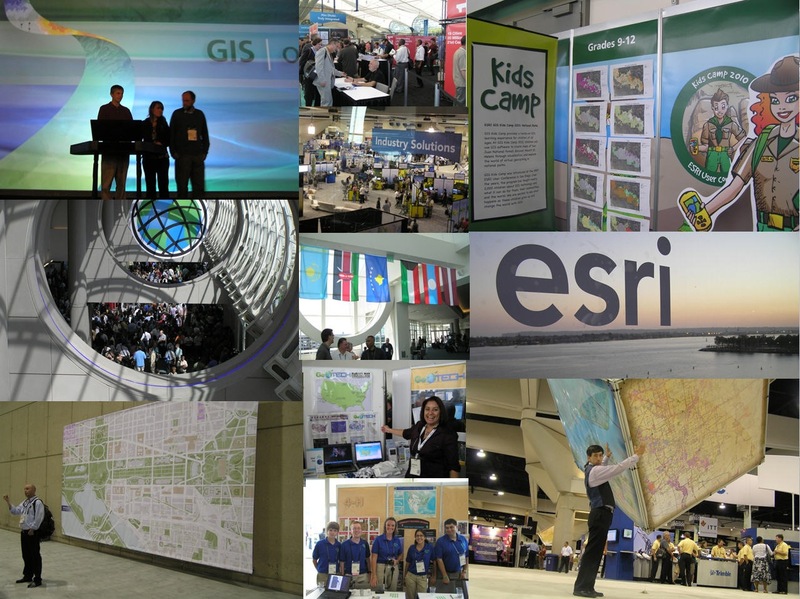 Examine a sample of papers given each year at hundreds of local, regional, nationwide, and international GIS conferences (such as at the ESRI User Conference), books, journals, and articles listed on the ESRI GIS bibliography, and the annual ESRI Map Books. Look at how GIS is used daily by organizations from local to global scale, including departments of natural resources, the Nature Conservancy, and the United Nations Environment Programme. Review the “best practices” booklet showing how GIS is green technology, in which GIS is described as helping site optimal locations for wind turbines and roofs for solar panels, maintaining tree inventories, and improving wetland habitat. But dig deeper than simply topics labeled as “environmental”: When GIS makes vehicle routing more fuel efficient or when GIS restructures city operations so that underground cable upgrades are done before the street over those cables is repaved, those operations are also “green” because they save resources. All environmental issues have a spatial component. GIS is used for these green applications because it provides a unique, spatial perspective on those issues, promoting creative problem solving. Most of us want a career where we can make a positive difference in the world. Using GIS is not only interesting and marketable—it brightens the future for all of us. Last week I wrote about what several geographers consider to be the “grand challenges of Geographic Information Sciences.” But to grapple with these grand challenges, we need to have people moving into the field of GIScience in the first place. To do that, we must engage students in thinking about their community, region, country, and world in a geospatial context, beginning at young ages. How can we help students to see that every major current issue—from natural hazards, biodiversity, agriculture, energy, water quality and availability, human health, social justice, politics, migration, climate, crime, and many more—are inextricably linked to geographic processes that occur over space and time? Using GIS is one powerful way of seeing these patterns, processes, and connections. Students using GIS apply scientific inquiry—ask a question, gather data, understand data, analyze data, draw conclusions, and develop a fuller understanding about a particular issue. One of my favorite aspects of using GIS in instruction is that it helps to understand change. Changes from human and natural causes occur all around us, and if students analyze why and how things change, then they can begin thinking on a deeper level: Should the Earth be changing in these ways? Is there anything that I could or should be doing about it? This captures not only the heart of spatial thinking, inquiry and problem-based learning, but also empowers students as they become decision-makers to make a difference in this changing world of ours. GIS has ties to many disciplines, but a natural home for GIS in education is in geography, which has not seen consistent and high support over the past century in American education. How can we change this? I stated above that we must engage students in thinking spatially. But before that can happen, we must engage students, period. Too often, students are bored, viewing education as something that ends as soon as they graduate, instead of being a lifelong learning experience. We must allow them the freedom, support, and tools so that they can discover and pursue their interests. This may be the grandest challenge of all. All of the topics raised here can be debated and expanded. I look forward to your thoughts. - Joseph Kerski, ESRI Education Manager. Most of us, whether at the beach, in the garden, or in a sandbox, have drawn words on the ground. Have you ever drawn something with your GPS receiver? As you probably are aware, all GPS receivers automatically record a track of your position. A track is analogous to you dropping bread crumbs every so often to mark where you have been. You can walk in such a way as to trace shapes of various kinds that are recorded on your track. These shapes can be letters, circles, squares, or others. Begin by examining websites showing track results, from http://www.gpsdrawing.com/gallery.html to contributions to OpenStreetMap, and others. One of the earliest GPS drawings I ever saw was a decade ago where someone drew the word “IF” in England using a car. Each letter stretched from far north of London all the way down to the English Channel! 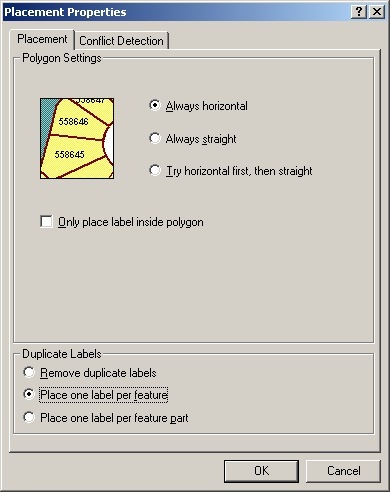 When you return from the field, you can upload these shapes into your GIS. Use an image or map from ArcGIS Online as a backdrop for your track. As you can see in the ArcMap session above, I drew the words “GIS” with my receiver. I often include GPS drawing while working with teachers and students and I encourage you to do the same. Why? Drawing with GPS forces us to think about spatial relationships. We must be aware of where we have walked, noting local landmarks, so that we do not cut across letters that we have already drawn. How can I walk so that each letter is shaped correctly, is distinct from other letters, and is aligned so that the word lies on an east-west axis? In the example above, because the streets on the Colorado Community College System were aligned northwest to southeast, I had to be careful not to follow the street grid, but cut diagonally across lawns for optimal results. How could I have done better? How does changing the track setting from distance to time, or changing the distance or time interval between recorded track points, alter the appearance of the letters? For added interest, have students draw their first or last name. What shapes would you like to draw with your GPS? GIS users are always on the lookout for interesting spatial data. Those who use GIS in education seek data that can be used to teach core concepts in a variety of disciplines. One of the most useful continent-wide spatial data resources is from the North American Environmental Atlas (http://www.cec.org/atlas). It contains data on watersheds, ecoregions, human impact on protected areas, industrial pollution, wetlands, land cover, conservation areas, and base layers including transportation, waterways, and cities. It also contains layers on 17 species of common conservation concern, such as the Burrowing Owl, the Mountain Plover, and the American Black Bear. 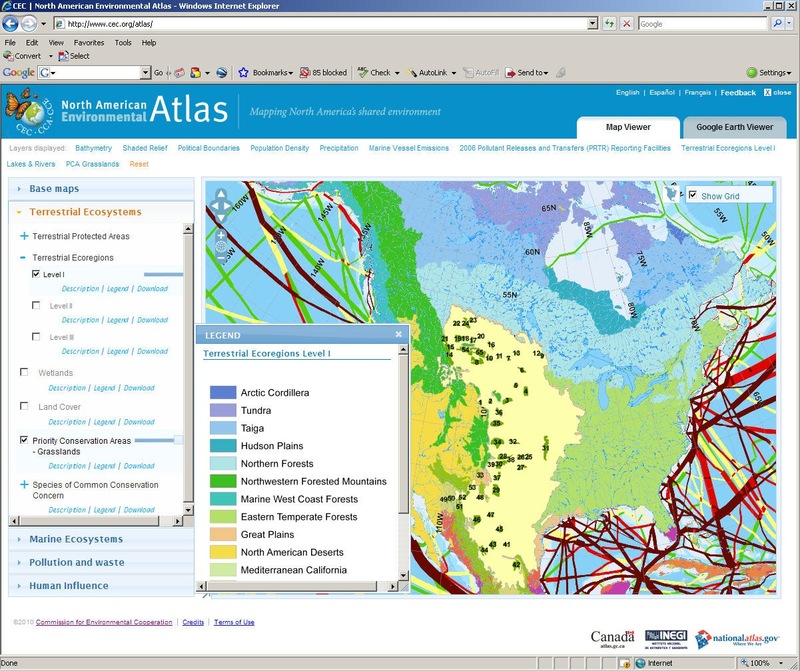 The atlas was born from collaboration among the national mapping agencies in Canada, the United States, and Mexico, and through the Commission for Environmental Cooperation. Its goal is to provide a foundation to analyze the status of environmental conditions and identify trends across the whole continent. The atlas is useful because of its rich content, the fact that it is comprised of public domain data, and because you can use it in three different ways. First, you may order up to 5 free paper wall-sized maps from the link on the site. Second, the content is offered as a Web GIS, meaning that you can examine the data interactively with just a web browser, made possible by ArcGIS Server running behind the scenes. What is the relationship between grasslands, rainfall, and elevation? Third, the data from the site is offered as downloadable shapefiles, layer packages, and map documents, ready for ArcGIS desktop. Metadata files are readily available and you can use the web GIS viewer for previewing the data before downloading. Why download the data if you can analyze it online? 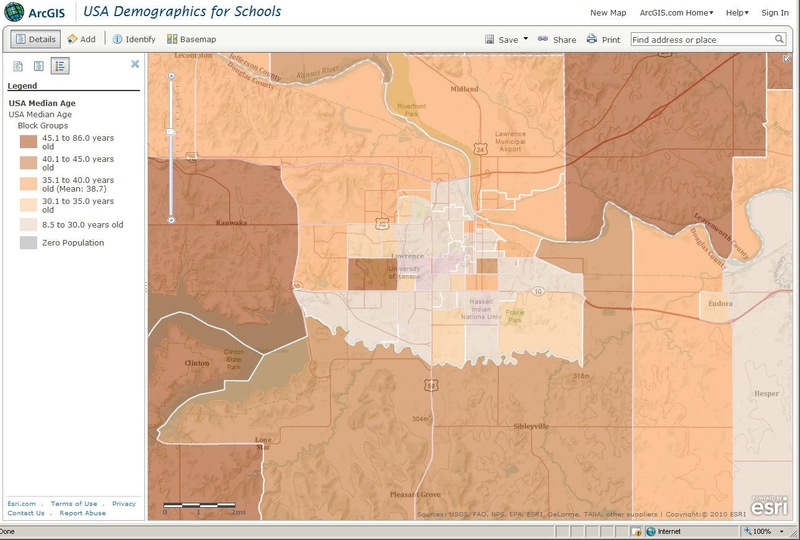 Both methods are valid approaches to helping students think spatially, but by downloading the data and using it inside ArcGIS desktop, you can dig deeper, analyzing the patterns across space, time, and with spatial statistical techniques. For example, you can assess how much burrowing owl habitat is within 10 kilometers of a pollutant release facility. I also like the atlas because it does not ignore the oceans—marine ecoregions, protected areas, and marine vessel emissions are all included. What types of analysis will you do with the North American Environmental Atlas? One of the consistently valuable concepts in inquiry-based education is cause-and-effect. GIS is an excellent tool to illustrate cause and effect because phenomena on our dynamic planet occur at different scales and over different time periods, and thus can be examined spatially. One of the very first scientific monitoring networks to go online was the data from USGS stream gaging stations. I remember looking up some of these reports on microfiche when I first started working at the USGS in 1989; the data was valuable but already “historical” by the time it was published. Today, ArcGIS Online provides the ability to analyze how current and recent weather affect streamflow in real time. 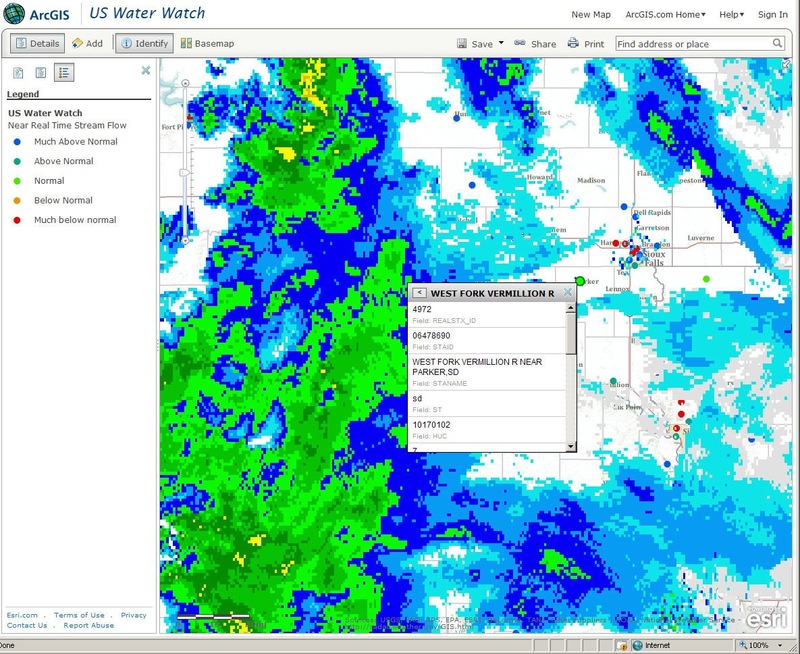 To do this, visit ArcGIS Online and do a search on “water watch.” Open the US Water Watch in ArcGIS Online in your web browser. You can select from thousands of gaging stations that are broadcasting current flow conditions, including some with real-time data on several water quality variables. I searched and added “US Current Radar” and today I see that the upper Midwest is experiencing some significant areas of precipitation. How does this impact river conditions in the area? I identified a gaging station on the West Fork of the Vermillion River near Parker, South Dakota, station 06478690, and pulled up its information, below. The identify window allows me to examine hydrographs and tabular data for the stream gage at this location. It reveals that the river is running at over 20 cubic feet per second, far above the mean of 0.7 cubic feet per second. 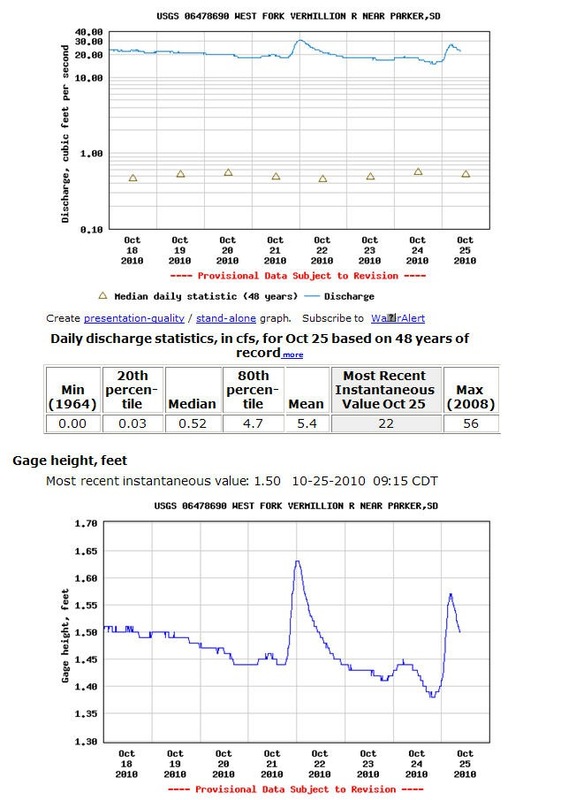 The gate height of 1.5 feet in the lower graph helps students understand how much water this represents. They could wade across the river at this height, although caution near rivers is always a good idea. Students examining other rivers running over 20 times their normal discharge will find that it would be impossible to wade across many of these rivers. What other phenomena influence streamflow? How could you ask students to uncover the relationship of snowmelt, floods, or hurricanes to streamflow using ArcGIS Online? The World’s Most Remote Island Group: Hawaii? In a separate blog post at the ESRI Education Community, I investigated a claim that Bouvet Island is the world’s most remote uninhabited island using ArcGIS. At the same time, I mentioned that the definition of “remoteness” is subjective and therefore makes for an excellent classroom discussion and for investigation using GIS. If you’ve flown to Hawaii, you may have been amazed at long the flight is, and wondered whether Hawaii is halfway across the Pacific Ocean. The Hawaiian Islands is the world’s most remote island chain with a sizeable population, estimated at 1.288 million in 2008 (US Census Bureau). Honolulu is the most remote major city over 500,000 population, because the nearest city of equal or greater size is San Francisco, 3,841 km distant. Using ArcGIS and data from Book 2 of the Our World GIS Education series from ESRI Press, I set the data frame to Orthographic, centered near Maui at 21 North Latitude and 156 West Longitude so that I could see most of the Pacific Ocean on the map image. Which is closer to Hawaii—California or southwest Alaska? Using the circle tool, above, I found out that these two are just about the same distance away—3,515 km. This is approximate as the measure tool was used at a small scale. Is Hawaii halfway across the ocean? A visual assessment shows that this depends on the point at which one measures, for the Hawaiian Islands extend for hundreds of kilometers—over 1,000 including the seamounts. The southeastern inhabited Hawaiian islands are not quite halfway across the ocean: I measured with ArcGIS about 4,800 km from Hawaii to the nearest point on the Asian continent at Kamchatka, and 5,800 to Australia. Vladivostok (5,500 km) and Shanghai (6,400 km) are both farther than Kamchatka, and all are farther than North America. A discussion about map projections, distances, and error is most appropriate here, because the measurements differ by up to 1,000 km depending on the map projection used. Try these tools to investigate other islands! - Joseph Kerski, Education Manager, ESRI. Think about two ways you can consume food – at home or away from home. Think about how often you eat at home versus away from home. Food purchased in grocery stores and eaten “at home” is generally less expensive than food purchased and eaten in restaurant. Do you think that the ratio of food expenditure at home vs. away from home varies by country? If so, how and why would it vary? Do you think there is a geographic pattern of the ratio within the USA, by region or even by neighborhood? A new lesson in the ArcLessons library invites you to think spatially using common experiences of food purchasing and consumption, to analyze the relationship of food purchasing versus median age and household income, and to learn how to use ArcGIS Online as an analytical tool. The lesson uses a standard web browser to access the food expenditure map on ArcGIS Online. The food data represent just two of the hundreds of variables available in the Esri Consumer Spending database. Esri combined the 2005-2006 Consumer Expenditure Surveys from the Bureau of Labor Statistics to estimate these spending patterns. I wrote the lesson around 10 focal points, including “scale matters,” national patterns, urban vs. rural, patterns within cities, famous foods and cities, university towns, retirement communities, areas with low population density, median age, and median household income. To compare these last two variables to food expenditures requires the addition of two additional layers, which is easily done in ArcGIS Online. The ability in ArcGIS Online of comparing different variables across space is a valuable educational tool. 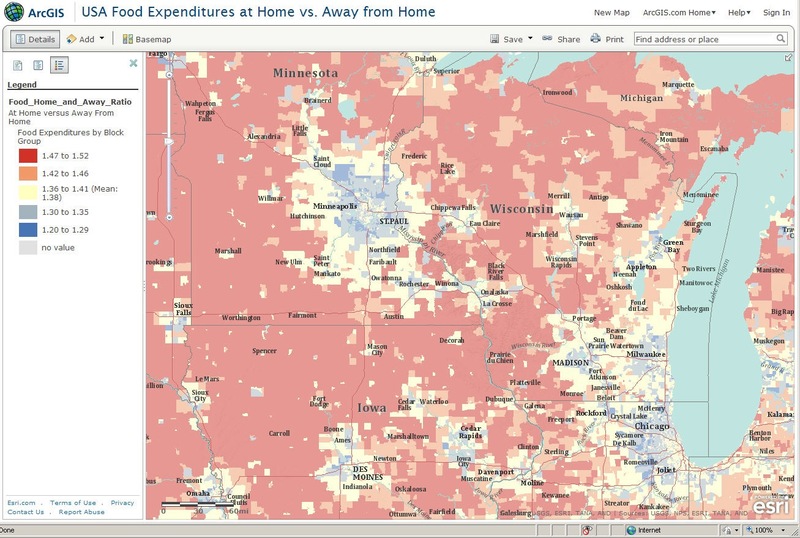 The web GIS map displays a ratio of the average annual household expenditure on “food at home” to “food away from home.” Areas in red represent areas where households spend noticeably more at home, while blue area households spend noticeably more away from home. Households in an “average” area tend to spend $1.38 on food at home for every $1.00 on food away from home. This ratio of 1.38 does not mean that food at home is more expensive; it means that more money is spent for home consumption of food than money is spent away from home. In other words, most people eat at home more frequently than they eat away from home. Where the ratio approaches 1:1 represents areas where an equal amount of money is spent on food at home versus away from home. Red areas are above this average, blue areas are below this average, and yellow areas are near the average. Why do many metropolitan areas contain neighborhood where the ratio is high, surrounded by a suburban ring where the ratio is low, surrounded by rural areas where the ratio is high again? Why do rural areas in Nevada and Utah seem to have a lower ratio than rural areas elsewhere? What spatial patterns of food expenditures can you discover using this Web GIS resource? What implications do these patterns have? We laugh at the scene in the movie “Vacation” when Chevy Chase’s family finally arrives at the rim of the Grand Canyon, only to snap a few photos for a minute before getting back into the car and driving to their next destination. Yet how much of our fieldwork is brief and limited to just a few of the five senses? Earth Day provides an annual reminder that fieldwork is critical to what the GIS education community believes in, advocates, and analyzes. Nowadays, we have so many map, video, and data sources along with GIS tools at our fingertips that it is tempting to think we can “get by” without doing any fieldwork. Indeed, in these days of educational funding constraints when fieldwork involves high costs, permissions, and effort, these resources are extremely welcome and valued. We on the Esri education team work closely with the education community to promote active fieldwork. We work with the American Geological Institute on Earth Science Week and with those promoting “No Child Left Inside” initiatives; we make use of the documents on the Place Based Education Initiative, and promote the use of probes, GPS, and other mobile devices to provide primary data to map and analyze within a GIS environment. But the importance of fieldwork goes far beyond the GIS education community. Sobel’s Beyond Ecophobia: Reclaiming the Heart in Nature Education (1996) makes it clear that children are disconnected from the world outdoors, but yet are as never before connected with endangered animals and ecosystems around the globe through electronic media. 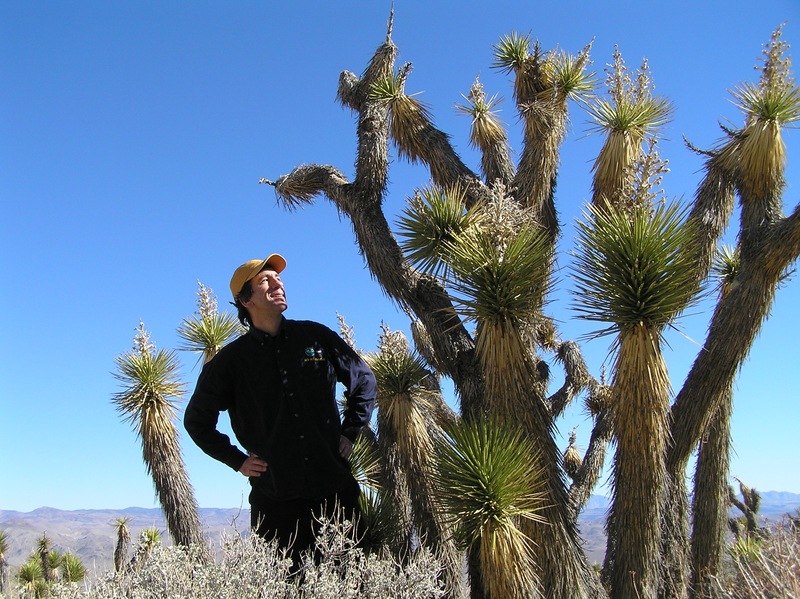 He states that essential to helping students to understand environmental issues in distant lands is to cultivate connections to the local environment by teaching about local systems. “What’s important is that children have an opportunity to bond with the natural world, to learn to love it, before being asked to heal its wounds.” This can be done through his stages of empathy, exploration, and social action. His statements such as “Authentic environmental commitment emerges out of firsthand experiences with real places on a small, manageable scale” are expanded in his book Place-Based Education: Connecting Classrooms and Communities. These ideas were brought to the attention of additional educators and the general public by Louv in his book, Last Child in the Woods (2005). Even if students cannot get away from campus, they can still collect data right on their own school grounds. I taught for a week with Dr Herb Broda awhile back, and his book SchoolYard Enhanced Learning provides excellent ideas on how to do just that. To support your continued advocacy for fieldwork in your own educational institution, I created a video entitled “Why is fieldwork important?“. How might you make every day an “Earth Day” in terms of exciting your students about the importance of observing the world around them? A principal aim of geospatial analysis is examining and understanding change over space and time. One of the simplest yet most powerful things you can do in ArcGIS desktop (www.esri.com/arcgis) or in ArcGIS Online (www.arcgis.com) is to visualize change over time by studying change based on different basemaps created on different dates. 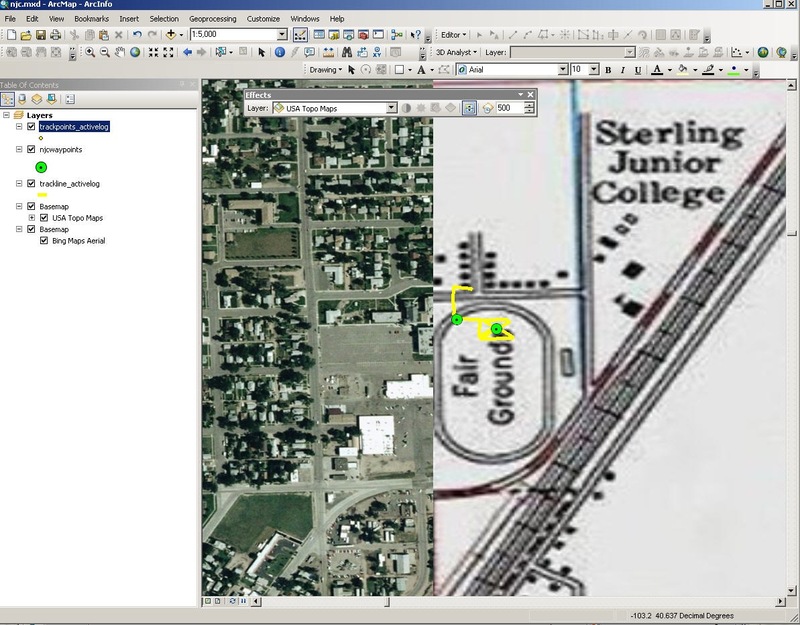 For example, I recently conducted a GIS workshop for educators at Northeast Junior College in Sterling, Colorado. While on campus, in ArcMap, I added satellite imagery as well as the USGS topographic map. 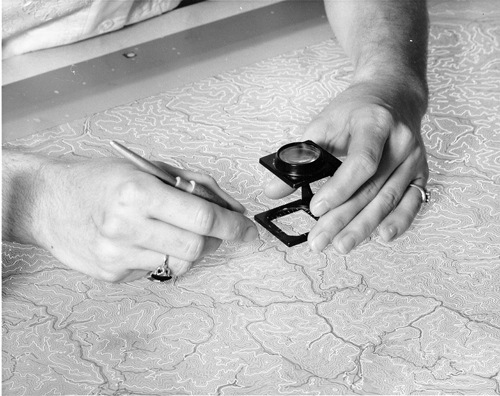 I determined the date of the topographic map (1971) by accessing the USGS Map Store. I found the date of the satellite imagery (2009) by using the Identify tool in ArcMap on the imagery layer. I used the swipe tool so I could scroll back and forth across the map to easily compare the different basemap images. The nearly 40 years of changes revealed by comparing the topographic map to the satellite imagery indicated that the name and the location of the college had changed. The college had changed from Sterling Junior College to Northeastern Junior College, and had expanded from the northeast to the southwest. The current location of the college is the former Logan County fairgrounds. After mapping the route we took during our fieldwork with GPS receivers that day (shown in dark yellow on the map below), we discovered that we were on the old fairgrounds track. We could trace the fairgrounds track and then walk that same route on the current campus, noting what had changed. Comparing the two basemaps revealed changes beyond the campus, including the direction that Sterling had expanded over the decades, the expansion of commercial zoning into former residential areas, and even the renumbering of the interstate from I-80S to I-76. 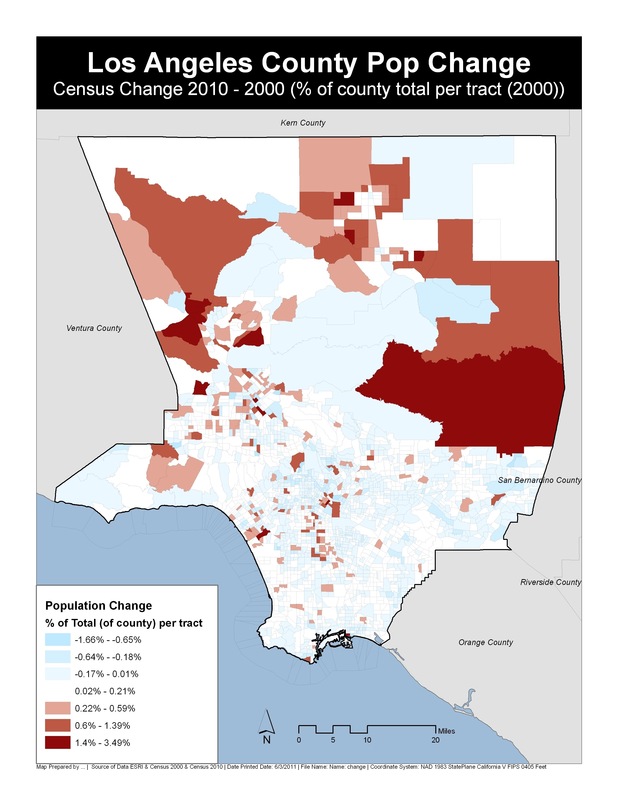 In ArcMap, we measured the areal extent of the city in 1971 and today, compared the percentage of expansion to other communities in the area and other communities of a similar size in the region, and examined population data of these communities. How might you analyze change over time using topographic maps and imagery of an area you are interested in? Analysis scale refers to the size of the unit at which a particular problem is analyzed, such as on a scale of a watershed or neighborhood. Phenomenon scale, as referred to by UCSB’s Daniel Montello, is the size at which human or physical earth structures or processes exist, regardless of how they are studied or represented. They are interrelated. For example, choices concerning the scale at which a map should be made depend in part on the scale at which measurements of earth features are made and the scale at which a phenomenon actually exists. Therefore, scale is important far beyond the map. It is important in deciding at what scale to analyze a problem. For example, for analyzing river systems, is it most appropriate to study whole drainage basins, or select a sample of watersheds? For languages, should you study dialect areas or whole language regions? We often use terms such as local, micro, meso, macro, and global in discussing scale. The idea of nesting is also important – blocks nest inside block groups, which nest inside census tracts which nest inside counties for US demographic analysis based on US Census Bureau geography. Sometimes we have to generalize features and phenomena to really see the pattern, simply because there is too much detail at a local level, and so generalization has to do with scale as well. I discuss all of this in a video on: http://esriurl.com/scalematters. 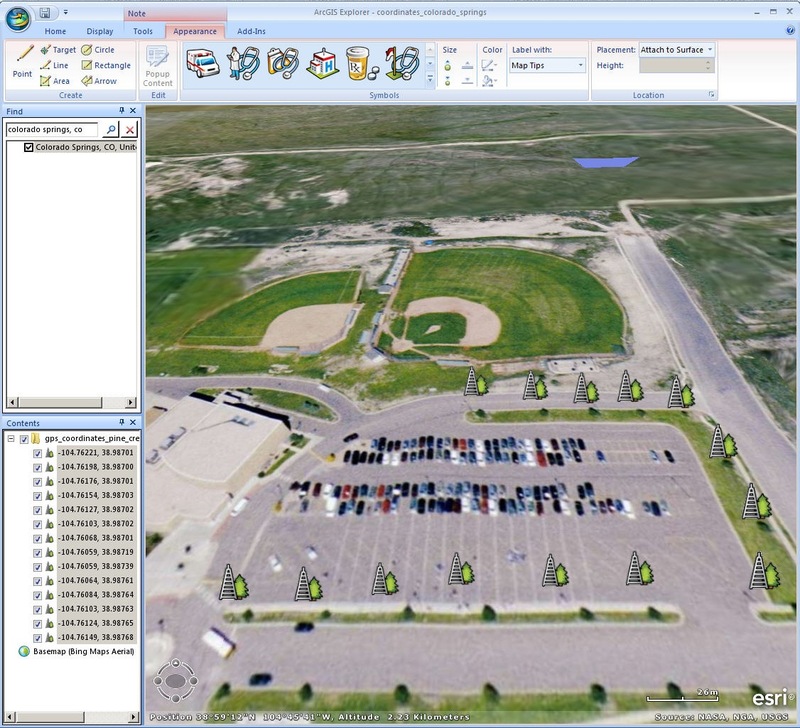 GIS contains many functions that can be effectively used in teaching about scale. How might you use GIS to teach about scale? Understanding geography and using GIS as an analytical tool in education and research requires a sensitivity to and an awareness of scale. This provides a framework for understanding how events and processes influence each other. Any phenomena we are studying at one scale can be influenced by phenomena operating on other scales. For example, traffic patterns affect local neighborhood zoning and movement, but also affect regional land use and reflect regional patterns of trade. They also reflect and can be studied in the context of national or international migration, economics, and demographic characteristics. Climate is another complex phenomenon that operates at multiple scales. 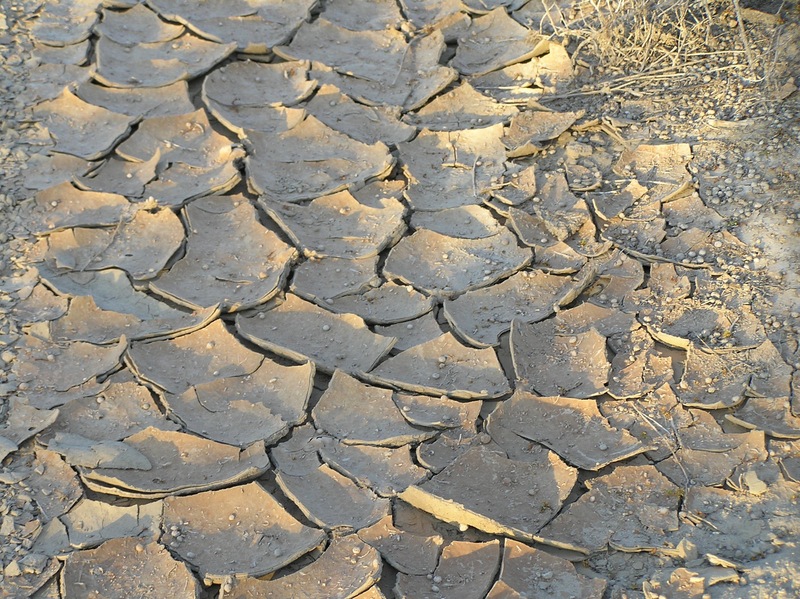 It affects weather on a local scale but also affects such global phenomena such as ice pack at the poles, sea level, and the location of deserts, rainforests, monsoons, and consequently, human settlement, agriculture, clothing and building styles, and much more. In between, at a regional scale, climate is affected by landforms, such as mountains, prevailing winds, and even eruptions of volcanoes. Thus, to fully understand our complex world, we must look at processes across multiple scales. Scale is about size. It can be relative or absolute. Scale can be about space, or about time, since things that occur across space almost always have a temporal component. For example, think about wildfires versus glacial advance. They have different spatial scales and different temporal scales. There is also a thematic scale, having to do with the grouping of attributes such as water quality or weather variables. Scale is a theme that runs through all of geographic analysis, because geographic analysis has to do with trends, patterns, relationships across space and, often, time as well. 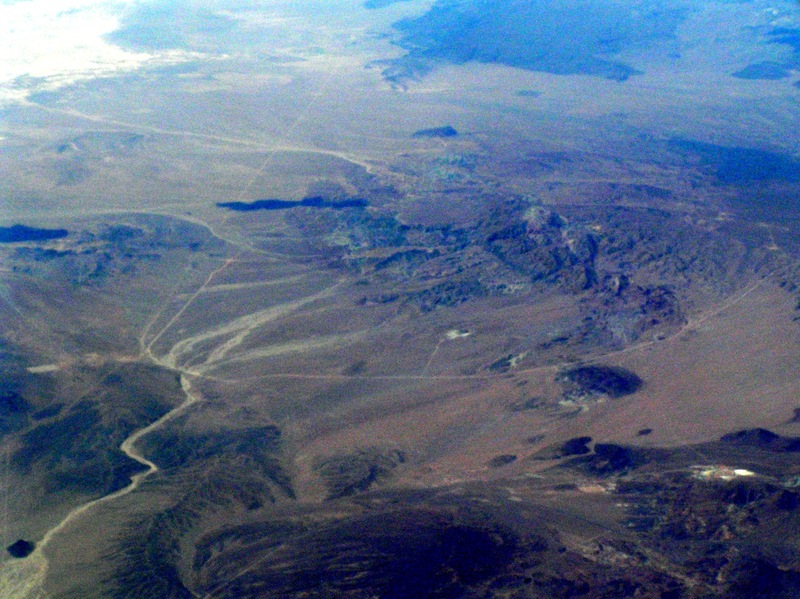 Consider the different processes operating on this landscape on a local scale, photographed on the ground, versus those operating at a regional scale, photographed out an airplane window of the same location. Several types of scale exist within geographic analysis. They are interrelated and are equally important. They are also important far beyond geography, in any discipline where spatial aspects are considered, such as in epidemiology, biology, earth science, or business marketing. 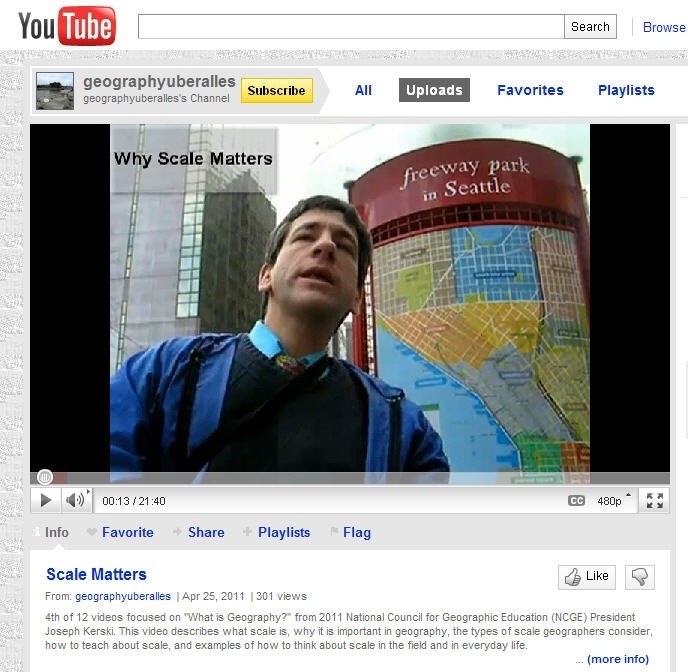 GIS can be used in a wide variety of ways to teach about each type of scale, which I discuss in a video on: http://esriurl.com/scalematters. I will discuss the different types of scale in the next blog. How might you use GIS to teach about scale? Spring in North America brings not only new flowers, but a new crop of tornadoes. The 2011 tornado season has already been horrific, and our hearts go out to all those affected. Like most natural phenomena, tornadoes exhibit a spatial pattern on a global, regional, and local scale, and a temporal pattern depending on season, time of day, and duration. Both the spatial and temporal components can be examined and understood with the use of GIS. To do this, I have written three lessons and compiled data sets that may help do just that. The first, Investigating Historical and 1 Modern Tornado uses ArcGIS Online (http://www.arcgis.com, search on “Tuscaloosa owner:jjkerski”) to examine pre- and post-tornado imagery that can be toggled on and off or adjusted in terms of opacity. Using these sobering data sets, the width and length of the Tuscaloosa tornado can be examined, as well individual building types affected, and historical tornadoes by decade throughout the USA. The second, “Investigating Historical Tornadoes Using ArcGIS”, allows for further investigation, which reveals that while more common on the Great Plains and interior lowlands, tornadoes have occurred in nearly every state, and are not as uncommon in the mountain west as one might think. Contrary to popular opinion, the data also reveals that Kansas is not the area with the highest density of tornado outbreaks. Do you know what state has the highest density? See below. Selecting the tornadoes by month shows the seasonal ebb and flow of the outbreak of tornadoes, starting from coastal areas near the Gulf of Mexico in January and increasing to a spatial maximum in July of each year. The numeric maximum occurs in April, three months earlier than the spatial maximum. During which six hour period do you think the most tornadoes touch down—between midnight and 6:00am, 6:00am to Noon, Noon to 6:00pm, or 6:00pm to midnight? Examining the historical data reveals that the tornado causing the most injuries (1,740) occurred in northern Texas in 1979 and the one causing the most fatalities (116) occurred in northeast Michigan in 1953. The lesson also invites you to discover in which elevation range tornadoes are most common, and the difference between tornado touchdowns and tornado tracks. 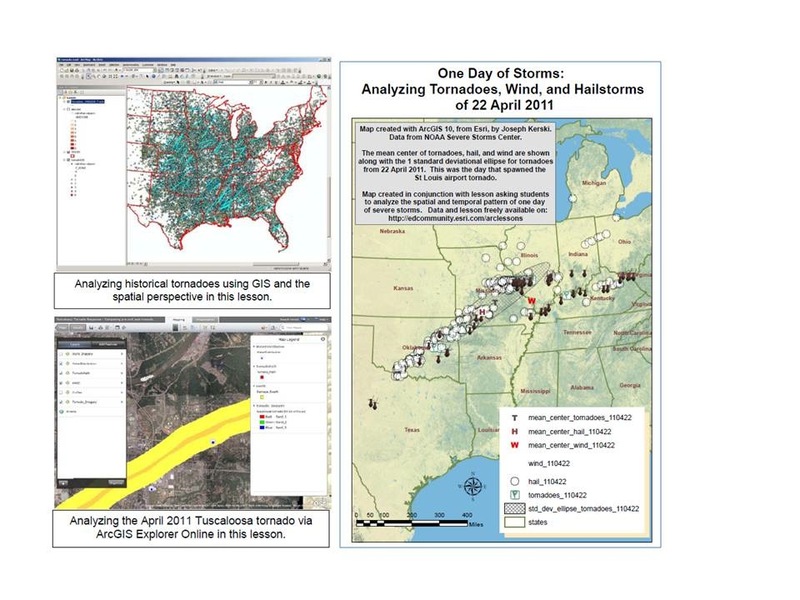 The third lesson invites students to download and analyze a single day of tornadoes. Using data from the NOAA Storm Prediction Center, the lesson begins with an analysis of 22 April 2011, the day of the tornado that caused damage at the St Louis airport. Analysis reveals that the airport tornado was only one point along a line of tornadoes that day in that region. Wind and hail for that day are also analyzed, including the determination of the mean center and standard deviational ellipse for all storm types. The lesson concludes with the students’ selecting a different day, downloading the CSV files from NOAA, and mapping and comparing them to 22 April’s storms. -Joseph Kerski, Education ManagerAnswer: According to this dataset, tornado density is highest in sections of Oklahoma. • Actual: Spatial analysis provides hands-on work with the same tools that decision-makers from a wide and expanding variety of professions use every day on the job. • Virtual: Using GIS, GPS, and remote sensing tools allow for immersive, multimedia-rich experiences that help us understand processes, places, and problems. • Critical: Using real data to analyze issues provides critical thinking skills about the issues themselves, about the data that we choose to use or not use, about how to communicate the findings, and much more. • Ethical: Examining real-world issues brings students face-to-face with such ethical decisions as the positive and negative impacts on people and the environment for land use decisions, whether and how to act on a problem, and how to present findings using maps in an unbiased manner. • Social: The use of GIS in education is often best done as part of a collaborative project in the classroom, in the community, or with those studying similar problems halfway around the world. • Psychological: The use of spatial technologies builds on research in spatial cognition, geographic and cartographic education, and other foundations, and takes advantage of multiple intelligences and learning styles. • Creative: Through symbols, colors, patterns, video, presentations, and other means, GIS fosters inventiveness and creativity. • Tactical: Using GIS helps accomplish a purpose—to understand something better, to make a decision, to see connections between places, processes, and phenomena. • Logical: Whether formalized through the use of tools like model builder or not, GIS helps frame problems in a logical manner so that they can be grappled with. Another way to think of the “logical” is through the disciplines engaged, from the geological to the hydrological to the sociological and beyond. • Practical: From its outset, GIS was created as a toolkit that could be useful in many different disciplines, at different scales, and in many different situations. It forces the user to be organized about how to access, store, and use a variety of different types of data. • Useful: GIS is useful in many different careers. GIS is useful from a technical standpoint, on mobile devices, desktop and laptop computers, and in the cloud environment. • Helpful: Not only is GIS used to help people make better decisions, but GIS helps improve the quality of their own lives, through better sanitation, medical care, sustainable development, and in other ways. • Essential: GIS is essential for grappling with key issues of the 21st Century—energy, water quality and quantity, climate change, natural hazards, political instability, urbanization, sustainable agriculture, and others that grow in importance on a global scale and also increasingly impact our everyday lives. Using GIS in education is essential in order to infuse these tools into societal decision-making. What other adjectives come to your mind when you consider the “GIS advantage”? Linking photographs to maps and saving and sharing those maps can be quickly and easily done using ArcGIS Online. These maps can be used to create a sense of place by telling a story about a community or a region. For example, I created a map of my home state of Colorado using photographs that I have taken at intersections of whole-degree latitude and longitude lines, as part of the Degree Confluence Project. Clicking on the pushpins yields a photograph that I have taken at that location, as determined by the GPS receiver that I carried to that point. Clicking on each photograph calls up a video that I filmed at that same location. 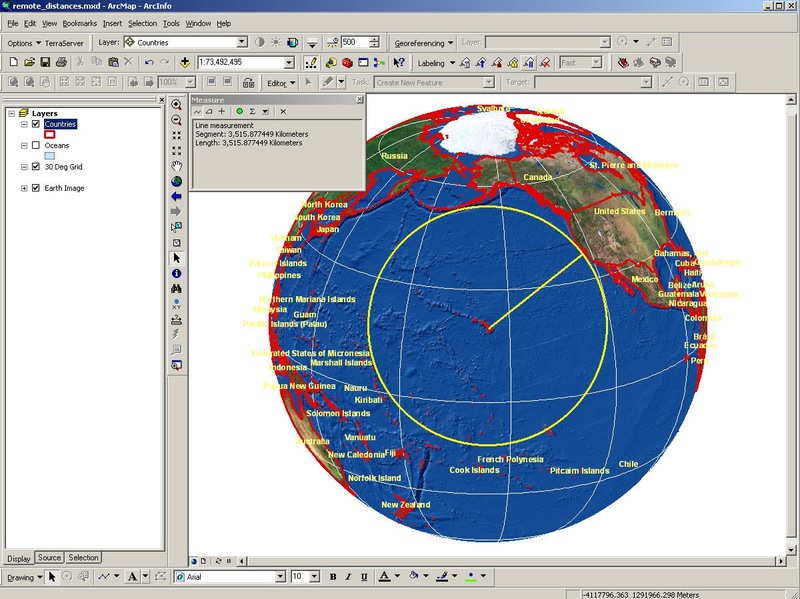 Each point was added by entering the latitude and longitude in the search tool, adding a point and a hyperlink, saving the points as a map layer, saving the map to ArcGIS Online, and sharing the map with the world. As you can see, I have a few more points to visit, but I hope to complete my map someday. How might you use photographs hyperlinked to maps using ArcGIS Online to describe and tell a story about an area in which you are interested? I recently had the good fortune of conducting a professional development GIS institute for educators recently at the new Science Technology Engineering and Mathematics (STEM) center at Overland High School and Prairie Middle School in Colorado. We found out about the center after meeting its director, Dr. Richard Charles, while hosting an Esri exhibit at the International Society for Technology in Education (ISTE) last year. My colleague Charlie Fitzpatrick recently described the connections of GIS to STEM. The school provides an extensive list of courses where technology is infused, from Grade 6 through 12. Students have the opportunity to select from five career concentrations that include art and technical communication, computer science and applied mathematics, engineering and technical sciences, natural resources and energy, and health sciences. This may sound like a community college or university, but remember that students ages 11 to 18 are taking these courses, which is visionary and inspiring. Double helix, human-powered sundial, and more geographic wonders at the STEM Center! What’s more, geospatial reminders surround the students and faculty, thanks to Dr. Charles’ careful work with the school’s architects and builders. Self portrait at the half-second grid etched into the flooring. Above me are the stars of the Northern Hemisphere in their correct relative positions, represented as LED lights, on the ceiling. Latitude-longitude lines in the STEM school's floor! There is even a DNA double-helix statue outside the front door of the building. 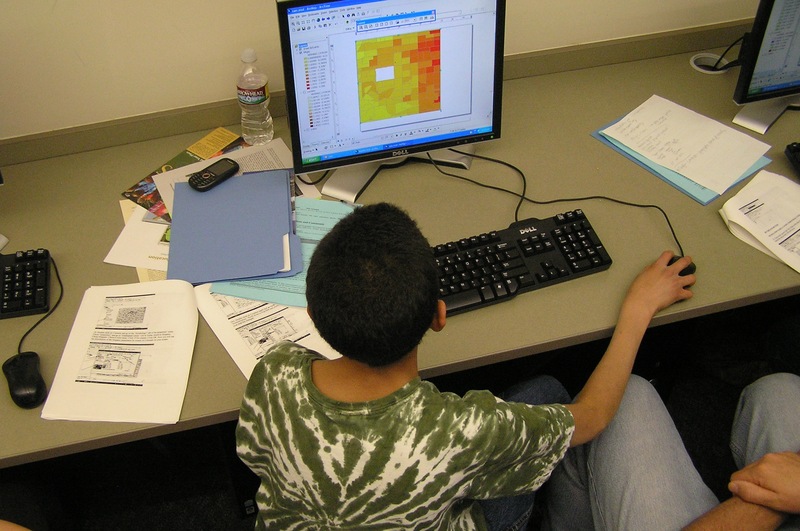 How might you promote GIS in STEM education? 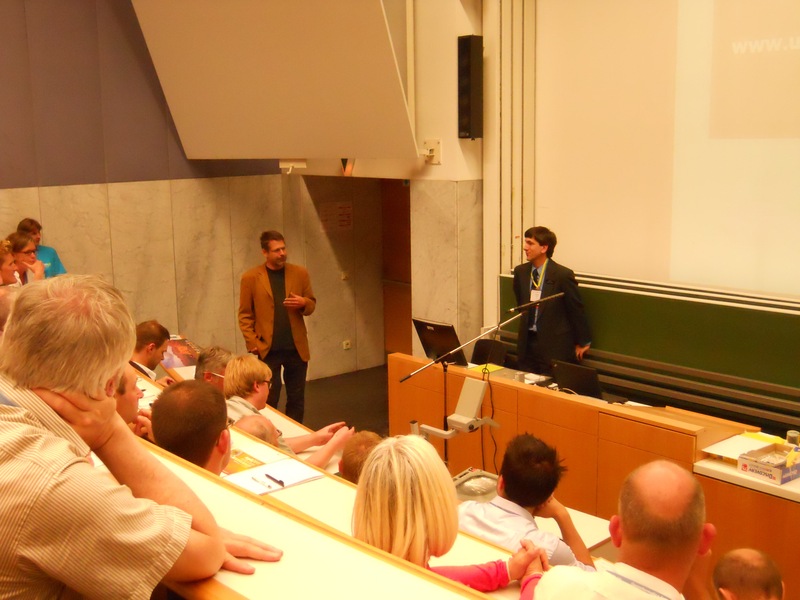 Recently I was invited to give a keynote address at the 2011 GI-Forum at the University of Salzburg, and created a map in ArcGIS Online that I used as my guide to the local physical and cultural geography. I shared it so that the other conference attendees could also use it, on http://esriurl.com/giforumsalzburg. I described this procedure in a recent blog entry but then went one step further: I used the same tool to create the keynote presentation that I gave at the conference. This presentation contains 57 slides and by searching for “GI-Forum” on ArcGIS Online, you can view it and use it to spark your own presentation ideas. I varied the basemaps and methods throughout the presentation to keep the audience interested, and I found that ArcGIS Online offered a number of significant advantages. 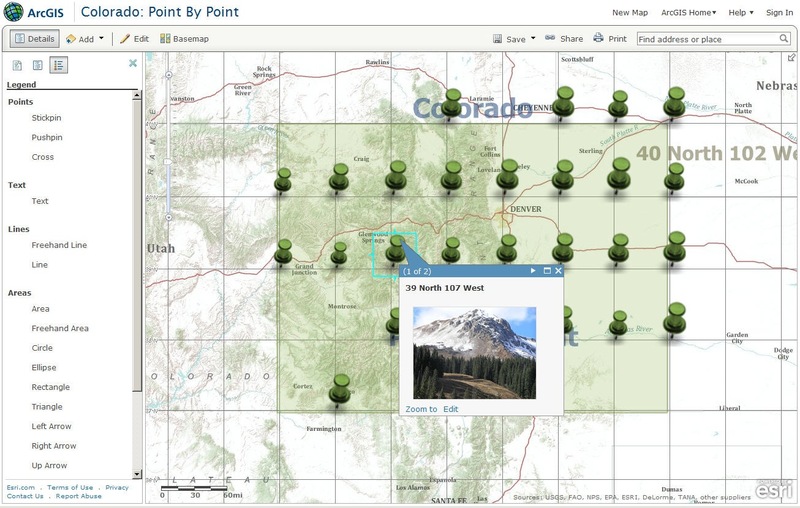 First, since ArcGIS Online is map-based, I could tie each of the points in my presentation to points on the maps. Second, the dynamic nature of the tool meant that at any point during the presentation, I could respond to questions from the audience and zoom to any location on the Earth, changing the basemaps or adding new content to respond to the question. After responding, I could easily resume the slides I had set up ahead of time. Third, I can now respond to those who are contacting me to find out if they can view it, simply by pointing them to ArcGIS Online. Fourth, I could easily go back and forth between my presentation and the local map with points of interest that I had created using the same tool. Fifth, as we all know when working with technology, the unexpected can and will happen. 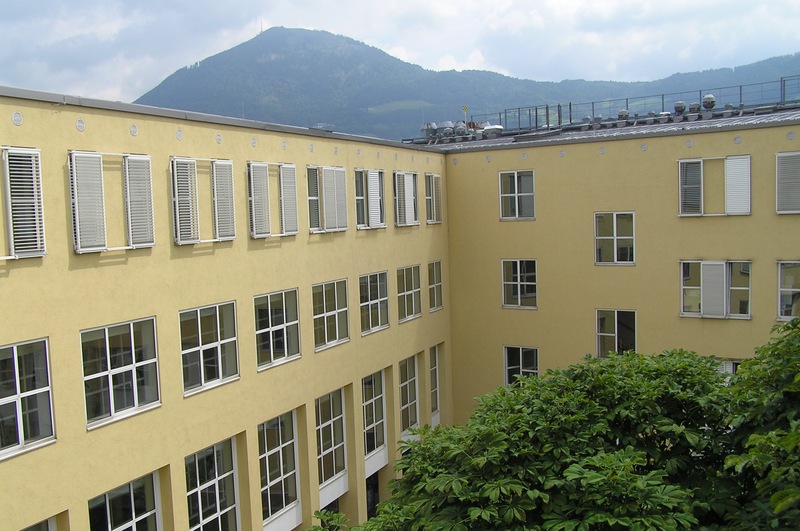 On a practical level, using ArcGIS Online for the presentation saved the day when my computer would not communicate with the projector in the lecture hall at the University of Salzburg. At the last minute, we substituted a computer from one of the faculty, and because the presentation used ArcGIS Online, I did not have to worry about transferring files or whatever presentation software they might have had on the university’s computer. Rather, I was able to access and give my presentation right away! How might you or your students use ArcGIS Online for an upcoming presentation or report, and how might you assess that presentation in the classroom? 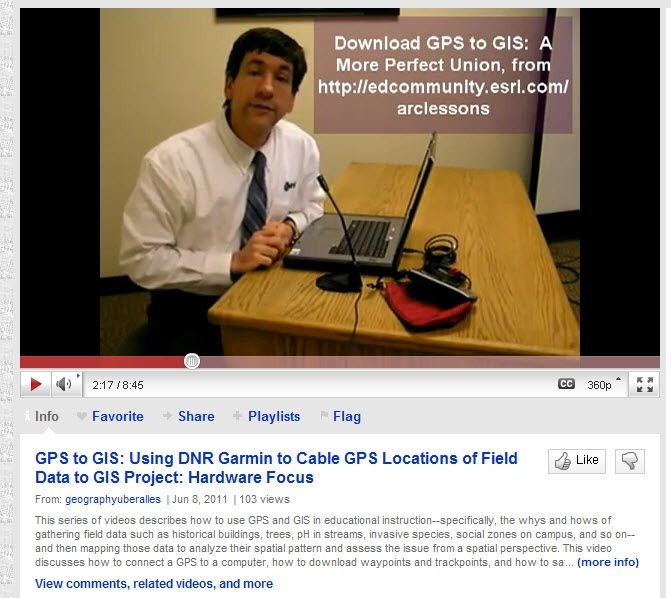 I have created a new series of videos on the Esri Education Team’s YouTube Channel and on my geography channel that describes the process of gathering field data with GPS and mapping and analyzing it with GIS in educational contexts. The videos feature explanations and demonstrations not only on the technical procedures involved with gathering data on locations and characteristics of data and then analyzing its spatial patterns, but also the pedagogical advantages to using these technologies within the context of spatial thinking in instruction. In short, they focus not only the “hows”, but also the “whys”. Introduction and goals of the video series. Considerations before embarking on a field data collection project. Collecting positions and attributes in the field with GPS and other devices. Considerations during and after conducting field investigations. Advantages to using a combination of GPS and GIS in the educational curriculum. Reflections on which tools and methods are most appropriate for use in specific educational settings. Cabling location and attribute data to a computer using the Minnesota DNR Garmin application; software considerations. Cabling location and attribute data to a computer using the Minnesota DNR Garmin application; hardware considerations. The difference between GPS tracks and waypoints. Accessing and using GPS-gathered waypoints and tracks. Mapping and analyzing field data with ArcGIS Online. Mapping and analyzing field data with ArcGIS Explorer virtual globe. Mapping and analyzing field data with ArcGIS Explorer virtual globe, part 2: Completed project: A Mojave Desert Joshua Tree example. Mapping and analyzing field data with ArcGIS desktop (version 10). Mapping and analyzing field data with ArcGIS desktop (version 10), part 2: Symbolizing and linking to multimedia. 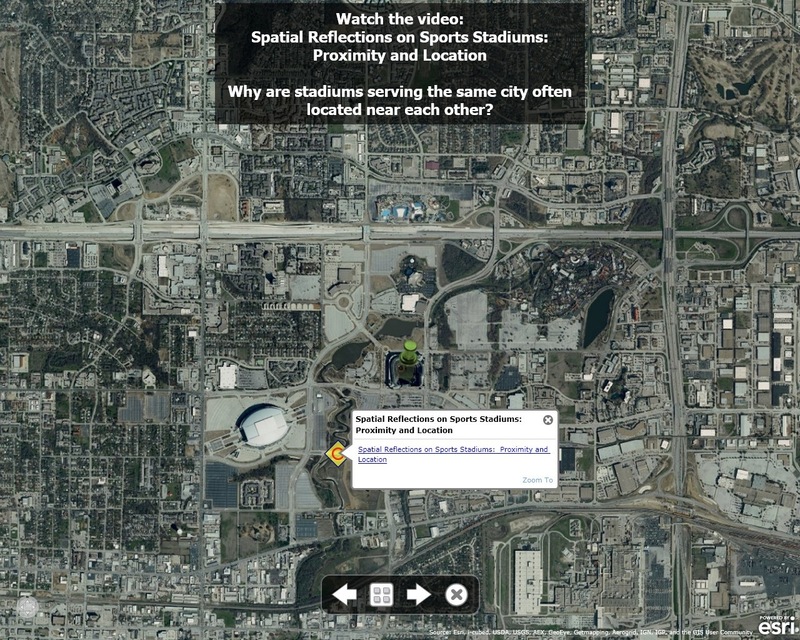 Using a smartphone for location, photographs, and video in gathering and mapping data. Using a smartphone for location, photographs, and video in gathering and mapping data, part 2: How to email photographs and videos from the field via a smartphone to a GIS to map and analyze it spatially. Using a smartphone for location, photographs, and video in gathering and mapping data, part 3: How to automatically geotag photographs and videos from the field via a smartphone to a GIS to map and analyze it spatially. Using a smartphone for location, photographs, and video in gathering and mapping data, part 4: Discussion and demonstration of how to automatically geotag photographs and videos from the field via a smartphone and a GeoRSS feed to map and analyze it spatially in a GIS. The positional accuracy of a smartphone versus a GPS receiver. Results of experiments comparing the positional accuracy of these two devices. Drawing with GPS, Mapping with GIS. Introduces and demonstrates how and why to draw letters and shapes with your GPS and mapping them with GIS. Dragging and dropping GPX files into ArcGIS Online locally. Dragging and dropping GPS files into ArcGIS Online internationally. Dragging and dropping text files with latitude-longitude coordinates into ArcGIS Online. How might you be able to use these videos, and more importantly, these methodologies, in your instruction? In a few weeks, I am giving a webinar entitled “The Top 5 Skills you need to be successful in a GIS career.” Because this is a topic that has been covered by dozens of articles in GIS journals and magazines over the past 20 years, I aim to do something different that stems from my educational work with the GIS community over that time. I argue that the first skill is curiosity. Successful GIS people are curious not just about geospatial technologies, but they are also curious about the world. They ponder spatial relationships at work in phenomena from the local to global scale, ranging from demographics, land use, and traffic patterns in their own community to natural hazards, biodiversity, and climate around the world. This curiosity fuels the tenacity that is often necessary to solve problems using GIS. This curiosity is also essential because it helps frame geographic questions, and asking the right kind of questions is the first step in the geographic inquiry process that is key to successful work in GIS. The second skill is the ability to work with data. Those successful in GIS have developed critical thinking skills regarding data. They not only know where to find data, but understand metadata so well that they know the benefits and limitations of working with each type of data. They know the most effective means to gather, analyze, and display geographic data through a GIS. The third skill is understanding geographic foundations. Successful GIS practitioners know the fundamentals behind all spatial phenomena, including map projections, datums, topological relationships, spatial data models, database theory and methods, ways to classify data, how to effectively use spatial statistics and geoprocessing methods, and more. Adaptability is the fourth skill essential for success in the GIS field. Now more than ever, as the field of GIScience is evolving rapidly in terms of its consumer audience, sensor network, functionality, the platforms by which it can be accessed on the desktop, mobile devices, and cloud, and in many more ways, successful GIS professionals need to be adaptable and flexible. They need to be not only willing to change but accept and embrace change as an essential and necessary part of the field. They are lifelong learners. The fifth skill is good communications. Those successful in GIS know how to use GIS and other presentation tools to communicate their results to a wide variety of audiences. 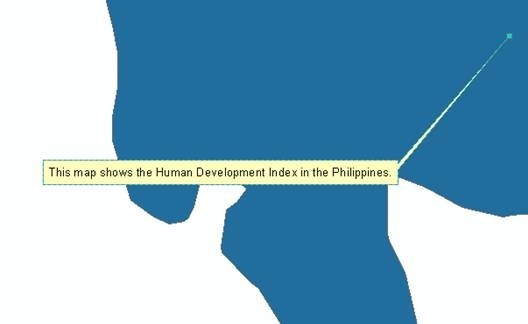 They know how to effectively employ cartographic elements, but they also know how to clearly communicate the results of their analysis in oral and written reports, video, face to face, online, and via other means. Do you suppose these skills will become more important or less important as geospatial technologies grow in their impact on society in the years ahead? Do you agree with this list? If not, which five skills do you believe are the most important? How can the Geospatial Technology Competency Model inform such a list? In my work with educators and students over the years, I have found that GIS is very well suited to the ill-structured problem. In fact, oftentimes, the best GIS problems are those that fit at least a few of the “ill-structured” criteria above. GIS was created to solve complex problems at multiple scales and from multiple viewpoints. Data in a GIS are imperfect, and are full of uncertainties, and students who work with them become critical consumers of data, an important 21st Century skill. Students are often so used to a single “right” answer, and are initially baffled by PBL-based strategies and tools that engage those strategies such as GIS. Typically when I work with students using GIS, they ask me, “Is my map right?” In response, I ask them a question: “Does your map help you understand the problem or issue, and help you answer the questions being asked?” But, given time, they begin to understand that the issues they are grappling with are complex, and there might not be a single correct answer. Certainly, their final set of maps is not the end goal, but a means to an end in their inquiry-driven investigation. For example, in the lesson that I created on analyzing the Hungary toxic flood of 2010 using ArcGIS Explorer, the environmental consequences of the flood are numerous, long-lasting, and occur at multiple scales. I ask the students to compare this incident with other toxic spills around the world, ending the lesson with asking students to analyze sources of toxins in their own community. Student answers will vary depending on where they live and how they judge the severity of different toxic spills around the world. If they can justify their answers, and back up their answers with data, including spatial data analyzed with their GIS tools, then I believe that their answers deserve high marks. Stepien, William, and Shelagh Gallagher. 1993. Problem-based learning: As authentic as it gets. Authentic Learning 50(7): 25-28. How can you design ill-structured problems using spatial analysis and GIS? And useful. David is part of a rapidly growing location-based services community. The subtitle of the journal where I found his article is “Location in the Language of Business,” and the community actively promotes and develops solutions for people to use GIS and maps to make effective business decisions. I believe there are several lessons from this field that are instructive to the GIS education community. First, according to David, the consumer packaged goods industry “hasn’t even scratched the surface of the potential for using location intelligence to manage the business, but there are endless possibilities.” I think this is true for other business sectors as well. In his view, location intelligence is a “dream” business development, marketing, and management tool.” Who will help show business decision makers the potential of maps and GIS? You, the GIS education community. The need is enormous. Now more than ever, companies need to be competitive through smart delivery, marketing, and reducing costs. GIS can help them do that. Second, David points out that maps show “patterns and connections revealed in data,” and maps are effective and engaging communication tools. The GIS and geography education community has long placed emphasis on these same principles; it has never been simply on the software tools. We need to hold to that course, but make this message attractive to the university and community college business programs. I know several business professors championing GIS, but they are, in my view, still too few in number to meet the needs of the business community. The demand of the business community is still small, and I believe part of the reason is that the business community literally doesn’t know what it is missing. I can’t fathom teaching a course in business marketing, for example, without GIS, but this happens all the time. Many in the Colleges of Business have either not heard of GIS, or if they have, think it is just something useful “over in the Geography Department.” But Business GIS courses cannot be offered if only one or two students are signed up for those courses. Therefore, we need more professors teaching with GIS and more students demanding the inclusion of GIS in business courses and programs. Books like The GIS Tutorial for Marketing from Esri Press and my business-focused colleagues at Esri and in academia have helped. But we have much work to do. How can we more effectively promote GIS in university business programs? The advent of another GIS Day provides a good opportunity to reflect upon the value of GIS. GIS is used, according to some estimates, by 1.5 million people each day, and by over 400,000 organizations. Even these estimates are a few years old. The point, though, is that to these people and organizations, GIS adds value. Otherwise, they wouldn’t use it. Why and how does GIS add value? GIS technology adds value to everyday work because it makes that work more efficient. We can accomplish more in a given workday. This is true for those managing a city’s bus system to those managing wildlife habitats, and in thousands of other situations. It is also true in education. Back when I was an undergraduate student working in the cartography lab, it took me several days to make a dot density map for Iowa counties, inking, for example, one dot for every 1,000 hogs. I did so on a special large format plastic material using various thicknesses of Rapidograph pens and my Leroy lettering kit. Nowadays, with a GIS, creating this type of map takes only minutes. I can change the dot density map to a chart map or graduated color map of the same data. More importantly, I can look at related agricultural data, the same data for a different area, or trends in hog farming over time. But beyond gains in efficiency, GIS has also opened up new possibilities. Reducing the time spent making the map has allowed me and thousands of others to do what we always wanted to spend more time on—analyzing spatial data, examining patterns, relationships, and trends. Don’t get me wrong—we still like making maps, but I don’t relish those hours next to the sink adjacent to the cartography lab, blowing water and air through the 000 pen to get the ink flowing again. GIS is also valuable because it is not one tool but a system containing hundreds of tools in a single environment. GIS also is valuable because it is an interdisciplinary toolkit. It is used to analyze social zones on a campus, the locations of hazardous chemicals or fiber optic cables, and species of plants in the gardens on that same campus. Globally, this same toolkit can be applied to subjects as diverse as urban planning, epidemiology, demography, wildlife management, and seismology. GIS is also valuable because it helps communicate complex ideas because it uses the powerful medium of the map, which for centuries has helped to explain connections. Today, the communications capabilities of GIS are enhanced with its close integration with other electronic multimedia. Through tools such as ArcGIS Online, it is easier than ever to tell a story through maps, and share that story easily with others. Finally, GIS is valuable because it enables critical thinking—about the data and the issues that the data uncover. What other reasons why GIS adds value would you add to this list? 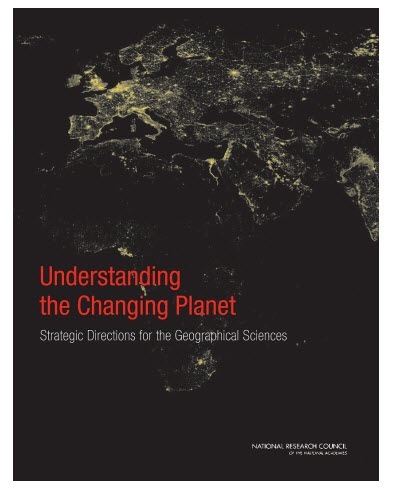 The National Research Council (NRC) has created a landmark report entitled Understanding the Changing Planet: Strategic Directions for the Geographical Sciences, which I believe has key implications for GIS education. Under the auspices of the NRC, the project was co-sponsored by the US National Science Foundation, National Geographic Society, the Association of American Geographers, and the US Geological Survey. Particularly insightful readings are Dr Michael Gould’s article about GIScience grand challengesand Dr Dawn Wright’s interview about the NRC report. The charge to the committee of geographers was to formulate a short list of high-priority research questions that are relevant to societal needs. The 11 resulting questions are squarely centered on many of the key issues of the 21st Century. I also believe that they fundamentally support what the GIS education community has been engaged in these past 20 years. The report can be effectively used as a means of communicating why it is vital that GIS education and GIS in education must be supported, nurtured, and strengthened throughout the educational system. But it is up to us, the GIS education community, to make the ties between our work and the NRC report clear and well known. 1. How are we changing the physical environment of Earth’s surface? 2. How can we best preserve biological diversity and protect endangered ecosystems? 3. How are climate and other environmental changes affecting the vulnerabilities of coupled human-environment systems? 4. Where and how will 10 billion people live? 5. How will we sustainably feed everyone in the coming decade and beyond? 6. How does where we live affect our health? 7. How is the movement of people, goods, and ideas changing the world? 8. How is economic globalization affecting inequality? 9. How are geopolitical shifts influencing peace and stability? 10. How might we better observe, analyze, and visualize a changing world? 11. What are the societal implications of citizen mapping and mapping citizens? Space does not permit me to discuss all of the linkages between this list and GIS education, but I submit that every one of these questions is tied to what and how we teach with GIS. In addition, the very reason GIS was created was to better observe, analyze, and visualize our world (question 10). Modeling, predicting, and managing change over time and space is what GIS enables people to do easily and effectively. Spatial analysis is critical to understanding environmental change, population and resource pressure, geopolitics and trade, and to promoting best practices and sustainable population, habitat, energy, and much more. As this list and report make clear, GIS is more relevant to society as never before. How might you use the Understanding the Changing Planet report to communicate the importance of your work in GIS education? Over the past year, several articles were written and presentations were given about the “education bubble.” Definitions of the bubble vary, but the articles made the case that unlike in the past, many of today’s students are not seeing a sufficient return on their university investment in terms of relevant workforce skills, to the extent that they were not being able to secure a job upon graduation or even to repay their student loans. One of the articles I found particularly interesting was an interview with English professor and Executive Director of the Association for Authentic, Experiential, and Evidence-Based Learning (AAEEBL), Dr. Trent Batson. 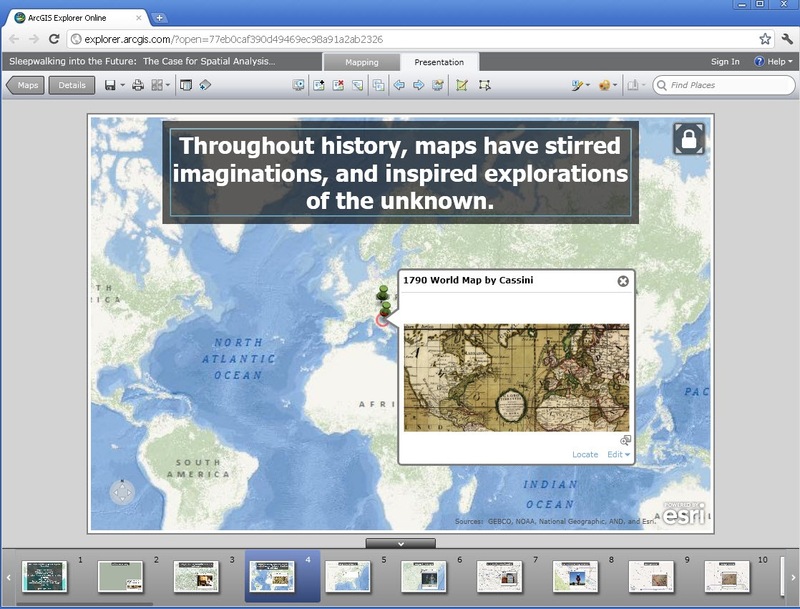 Presentations using ArcGIS and ArcGIS Explorer Online help students tell stories, investigate, and explain. ArcGIS Explorer Online presentations can be saved, shared, and returned to later, taking advantage of the “elapsed” time that Dr. Batson claims is valuable. ArcGIS Online presentations are not static; if peers or the instructor ask questions during the presentation, the student can change symbology, scale, region, add or subtract variables, reclassify, and perform other tasks that make the presentation a learning experience for everyone. Indeed, the whole notion of presentation is transformed, becoming an interactive and creative experience, throwing into question even the appropriateness of the term “presentation.” These interactive experiences are therefore a redesign of instruction favored by Batson and others. Do you agree that teaching and learning with GIS aligns well with innovative uses of technology as defined by Batson? Do you believe that educational GIS provides critically-needed skills for students while in school and upon graduation? How can we as a GIS community leverage research by Batson and others to promote and expand GIS throughout all levels of education? 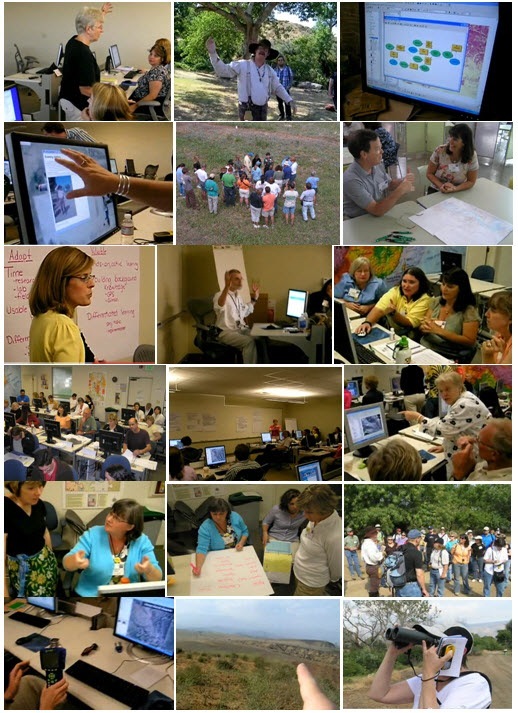 Several documents over the past 20 years have played key roles in shaping GIS in education and remain excellent resources for making the case why the work of the GIS education community is necessary. One of the first and one of my personal favorites was the U.S. Secretary of Labor’s Commission on Achieving Necessary Skills (SCANS) report. This report identified that the “task of learning is the real work of today, whether at school, in the university, on the job…” (1991, page 5). SCANS then stated (1992) that core subjects must be taught and learned “in context.” “In context” means learning content while solving realistic problems. Students are learning software, cartography, and GIS skills while using GIS to study world biomes, a regional watershed, or local community traffic, but they are also learning content. SCANS identified five competencies important for future work success: Resources, interpersonal, information, systems, and technology. “Resources” include identifying, organizing, planning, and allocating, while “interpersonal” means working with others in a diverse team. “Information” includes interpreting and communicating, and “systems” include understanding complex interrelationships. “Technology” is identified as working with, selecting, and applying technologies, and this too is fundamental to the work done with GIS. When we teach with GIS or about GIS, we typically use multimedia software and hardware, desktop and cloud tasks and data, smartphones and GPS, field probes and sensors, different operating systems, databases, data in many formats, spreadsheets, and scanners, just to name a few technologies, all in an applied fashion. The SCANS report can be effectively used as a means of communicating why it is vital that GIS education must continue. Moreover, it can help justify the case why GIS in education must increase in the disciplines where it is already established and spread to those that are not fully engaging with it. The GIS education community must make clear and well known the ties between our work and the SCANS report. Given the escalation in the importance of such critical issues as food, natural hazards, population, biodiversity, water, and energy in our world, spatial analysis through GIS is even more relevant to education than when these reports were written 20 years ago. How might you use the SCANS report to communicate the importance of your work in GIS education and gain support for that work? BibliographyU.S. Department of Labor Secretary’s Commission on Achieving Necessary Skills. 1991. What Work Requires of Schools. Washington DC: U.S. Department of Labor.U.S. Department of Labor Secretary’s Commission on Achieving Necessary Skills. 1992. Learning a Living: A Blueprint for High Performance. Washington DC: U.S. Department of Labor. Take a look at this image. Which waterfall is shown in this image? What clues exist on the landscape to help you choose among the three options listed? Where is this glaciated terrain located? Examining maps and imagery seems to be an engaging activity for many people, young and old, all around the world. Consider the number of maps and images delivered daily by web GIS servers. I contend that the number requested for people who simply enjoy looking at the Earth compares favorably to the number served for wayfinding and research purposes. This interest can be effectively taken advantage in education by engaging students in a series of images or maps as a quiz or a contest. 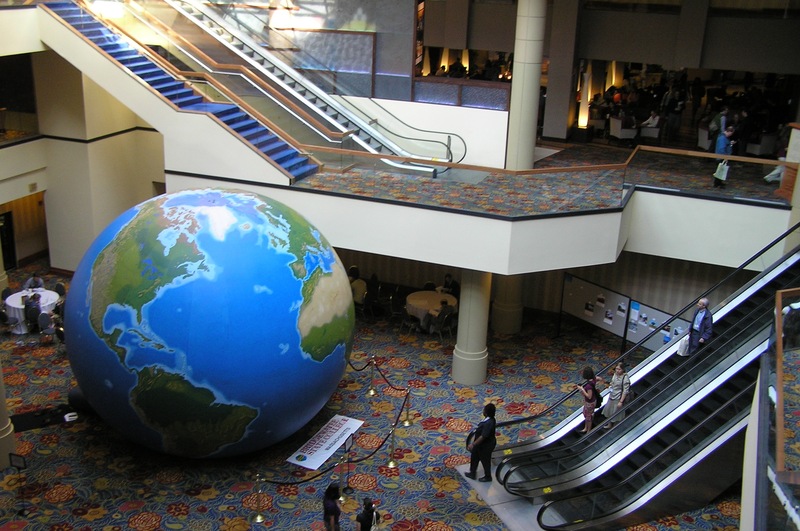 At the Esri User Conference each year, the “Where in the World” sets of imagery on display always attract a crowd. 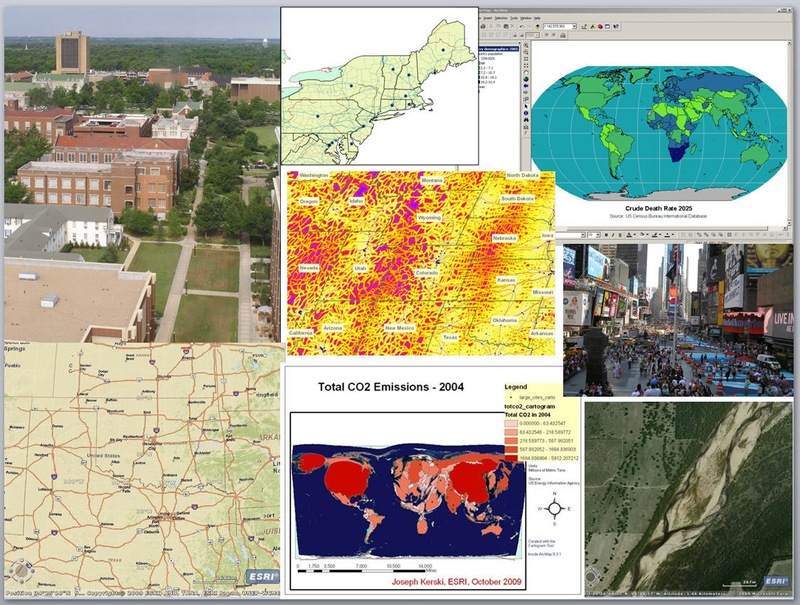 For nearly 20 years, I have frequently used map and image quizzes in classes I have taught and presentations I have conducted for geography, environmental studies, earth science, and other classes. These quizzes can be easily created and effectively used through the use of ArcGIS Online. Using ArcGIS Online’s presentation mode, for example, I created a 20-question Earth quiz. This quiz includes the images shown above as well as waterfalls, glaciers, deserts, rainforests, volcanoes, cities, and much more. You can view the quiz in presentation mode. More importantly, you can also run it inside ArcGIS Explorer Online so that you will be able to change the scale and basemaps, posing and answering questions, and fostering deeper inquiry into places and the processes at work behind those places. 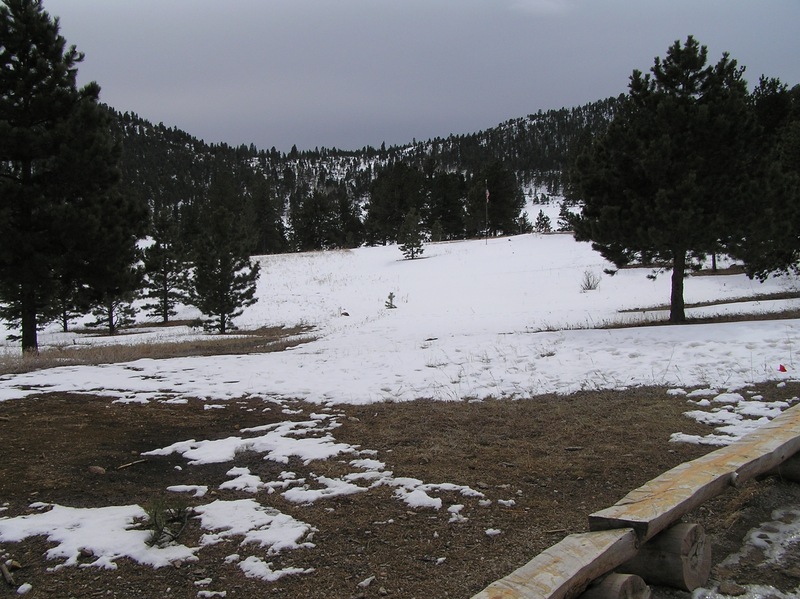 For example, when you engage your students in discussing glaciation using the above slide, you can zoom in to examine south versus north facing slopes and the amount of snow cover on each. You can zoom out until someone recognizes the location. Then you can discuss the effect of latitude and altitude on glaciation. You can change the basemap to topographic to determine the height of the mountains and the depth of the valleys and determine slopes. You can add land cover, climate, and population map layers and discuss how each is affected by the presence of these glaciated mountains along the west coast of this country. Thus, these are by no means static “slides” and calling them slides is really a misnomer. Even better, instructors can create their own quizzes focused on other processes, specific themes, specific regions, or their own community. Consider a quiz-based presentation focused on a community issue such as an area proposed for rezoning, or a process such as river meanders, erosion, and sedimentation. Well, how did you score on the 20-question Earth Quiz? How might you use the idea of an Earth Quiz in your own instruction? How might you use ArcGIS Online in your own instruction? David Jonassen (1995) described seven qualities of meaningful learning with technology. They are: active, constructive, collaborative, intentional, conversational, contextualized, and reflective. These are valuable not only to keep in mind when teaching with GIS, but to be purposeful, asking before each class, “How can I be active in my teaching with GIS today?” “How can I be conversational?” and so on. Those I know who teach with GIS are good examples of putting these qualities into practice. Their teaching is never just for the technology’s sake, even when it is with the goal of increasing the students’ GIS skills for career readiness. They teach in context and with a purpose, asking students to reflect on problem-solving, data, scale, critical thinking, and more. Jonassen and others make a strong case for the value of situated learning, or learning in context, which is exactly what teaching with GIS entails. Technology is more than hardware; it consists of the designs that engage learners. Learning technology is any environment of a definable set of activities that engages learners in knowledge construction. Knowledge construction is not supported by technologies used as conveyors of instruction that prescribe and control all learner interactions. Rather, technologies support knowledge construction better when they are need-driven or talk-driven, learner-initiated, and when interactions with the technologies are conceptually and intellectually engaging. Technologies as toolkits enable learners to build more meaningful personal interpretations and representations of the world. According to Jonassen, learners and technologies should be “intellectual partners”, an intriguing concept in which the cognitive responsibilities for performing are distributed by the part of the partnership that performs it best. Let’s say you are studying the relationship between elevation and rainfall on the windward and leeward sides of mountains. Calculating how much rainfall occurs at different elevations and on the western versus the eastern sides of the mountains through overlay would be something you would let the GIS software do. But your final assessment that incorporates multimedia and a presentation relies more heavily on your own input and reflection—not something that the software can do. This is one of my favorite things about teaching and learning with GIS. The software is the enabler and the GIS user provides the solution. How are you incorporating elements of Jonassen’s seven qualities in your own GIS-based instruction? A question that gets increasingly asked on listservs and forums these days is advice by those who are planning a course at their university that focuses on spatial thinking. These courses may be entitled “Introduction to Spatial Thinking” but there are numerous variations, depending on the goals of the university and hosting department. It is exciting to learn about these new courses and those who are planning them, because it shows that the message that we in the geospatial education community have been sharing for years is at last getting out beyond our own community. That message has consistently been that spatial thinking and spatial analysis are too valuable to be held by a single department, program, or school on campus, whether it is Geography, Natural Sciences, or anything else. Rather, spatial thinking and analysis, and the use of GIS technology and methods as an aid in teaching those concepts, are valuable to the student’s overall education, career skills, and to society. These concepts and skills therefore need to be embedded in all departments on campus as part of a rigorous and innovative 21st Century education. Such courses not only provide theoretical and practical background for GIS courses, but also for any discipline in which the “where” question is important—in business marketing, environmental design, wildlife biology, history, civil engineering, geology, epidemiology, geography, and beyond. How should such a course be planned and built? Fortunately, some good models exist. For example, the course developed by the GeoTech Center provides a checklist vetted by numerous GIS education professionals on what might be included. Dr Bone at the University of Oregon is developing a freshman-level course entitled Our Digital Earth, which will provide hundreds of students annually with an appreciation of the ubiquity of geospatial data and technologies in their everyday lives, and how the geospatial revolution is shaping societies around the world. Dr Diana Stuart Sinton developed courses at the University of Redlands such as Foundations of Spatial Thinking. Other example courses can be found in the “case studies” section of the Esri EdCommunity and in the pages of Esri publications ArcWatch, Esri News for Education, and ArcNews. I will follow this post with my own thoughts about what might be included in such a course in future blog essays. In the meantime, please share your thoughts: What would you include in a course on spatial thinking? Soccer fields and playgrounds provide some means of allowing youth to get outside. But, as Richard Louv so well stated in his book Last Child in the Woods, these adult-constructed environments are no substitutes for “wild places” – those places that are untouched or minimally touched by humans. “Wild places” could be a local ridge or hill, a stream or pond, or even a vacant lot. For me growing up in western Colorado, I loved the riparian zones that were adjacent to local gullies, what the locals called “washes.” In this semiarid landscape, walking down into these riparian zones was like descending into another world. They were sometimes so much lower than the surrounding landscape that sharp cliffs in the shale enclosed them. A different and a greater abundance of vegetation added to their character—indeed, they were a mini-ecosystem, but to a child growing up, like a whole different world. They were filled with sage, willows, yucca, and tamarisk—some native species, some invasive, all fascinating and so different from the alfalfa, orchard fruit, and corn being grown in the fields above. Another adventure awaited every autumn after the irrigation canals were shut off and drained. All sorts of strange things that had been hidden all summer were now in view along the canal beds and underneath the bridges that spanned them. How our senses were awakened to every new sound, smell, and sight in these washes and dry canal beds. Nowadays, we have a wide variety of electronic means at our disposal, from probes, GPS receivers, smartphones, to other devices, to record phenomena while in local wild places. The data can be easily mapped in ArcGIS Online. Yet I submit that before taking full advantage of learning with these means, three things must first be in place. The first is the ability to use one’s own senses and interpret the results of one’s own observations. The second is curiosity, and from curiosity comes asking questions. The third is the spatial perspective—seeing the world geographically. These three things sometimes take years to cultivate, and one could argue that this cultivation is a lifelong endeavor. Yet I certainly don’t recommend that instructors wait until all students exhibit curiosity before embarking on a field-based experience. Being purposeful about using all five senses takes practice. In addition, most students will have no idea at first what it means to “think spatially.” And don’t be discouraged if despite your best laid plans, some students appear completely disengaged from your carefully designed field experiences. Go back to Richard Louv’s advice on outdoor education—start early, and do it often. What are some of your methods of instilling curiosity about the world around us—beginning with your own local wild place? Central to the interest of the GIS community is spatial data: Where to find it, how to use it, how to gauge its quality, its scale, format, and resolution, privacy issues, copyright and licensing, the policies that govern the use of data, the role of data in the evolution of spatial data infrastructures, fee vs. free issues, cloud vs. desktop, downloading vs. streaming, crowdsourcing and citizen science, and a host of related issues. I am pleased to report that a book that Jill Clark and I co-authored on this subject has been published by Esri Press, entitled The GIS Guide to Public Domain Data. This book [website] is accompanied by a blog that we update weekly with data sources and news on the issues explored in the book. The book is also accompanied by 10 activities free to use that involve the access and use of public domain data to solve problems. These problems range from selecting the most suitable locations for tea cultivation in Kenya, investigating the Gulf Oil Spill, siting a café in a metropolitan area, assessing citizen science portals, creating an ecotourism map in New Zealand, analyzing sustainable land use in Brazil, analyzing floodplains in Colorado, and much more. These activities are linked to the concepts presented in each chapter, and are accompanied by quizzes and answer keys, designed for easy use by an instructor, students, or the individual GIS practitioner. All of these resources are linked to the Spatial Reserves site and reside on ArcGIS Online. Our goal for the text and the activities is to provide GIS practitioners and instructors with the essential skills to find, acquire, format, and analyze public domain spatial data. How might you use this book and its associated resources in your own GIS journey or instruction? Science, technology, engineering, and math (STEM) education is a multidisciplinary approach to improving education, the work force, and national competitiveness. President Barack Obama noted that “Strengthening STEM education is vital to preparing our students to compete in the twenty-first century economy, and we need to recruit and train math and science teachers to support our nation’s students.” (White House Press Release, September 27, 2010). 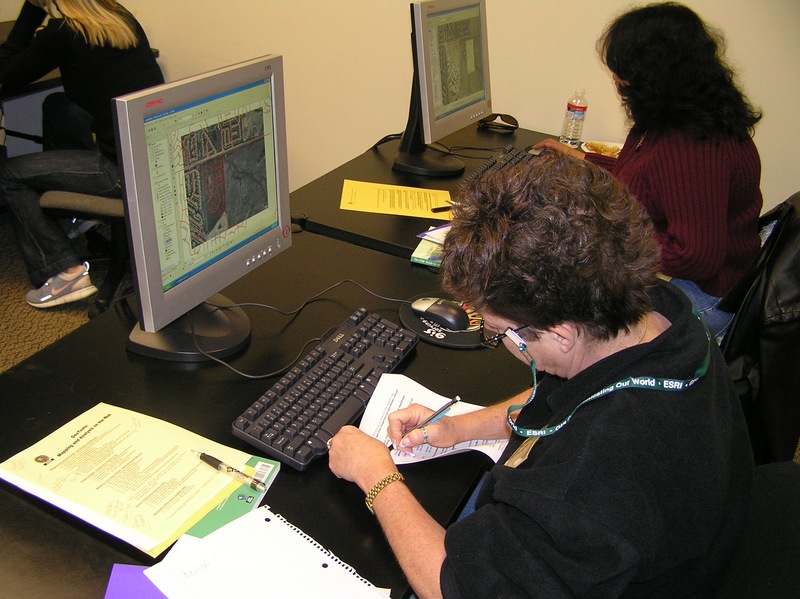 Geographic information system (GIS) technology can engage several critical elements in STEM curriculum and instruction. 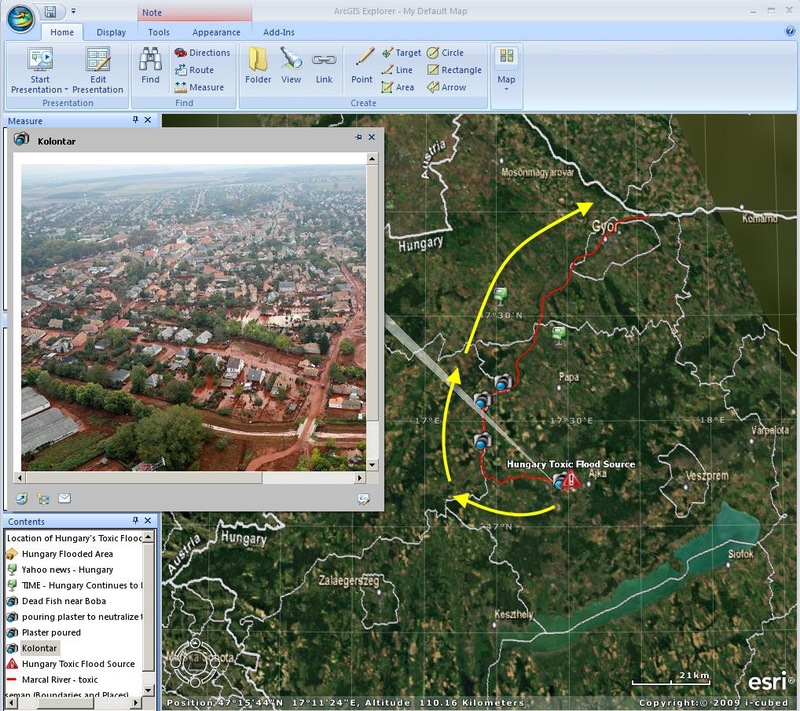 GIS tools and techniques lead to understanding cross-disciplinary phenomena and solving problems rooted in academic and real world concepts. People use GIS to make maps, analyze data, and decide on best solutions. From a curricular perspective, GIS allows us to study climate change, design cities, inventory geologic samples, plan ecological growth models, catalog contents of an archaeological site, and countless other activities. GIS and related geospatial technologies of global positioning systems (GPS) and remote sensing can be used to simultaneously engage students in science, technology, engineering, and math. The new ebook Advancing STEM Education with GIS is available now for download in PDF here(right-click to “Save as”), perfect for mobile devices and tablets.